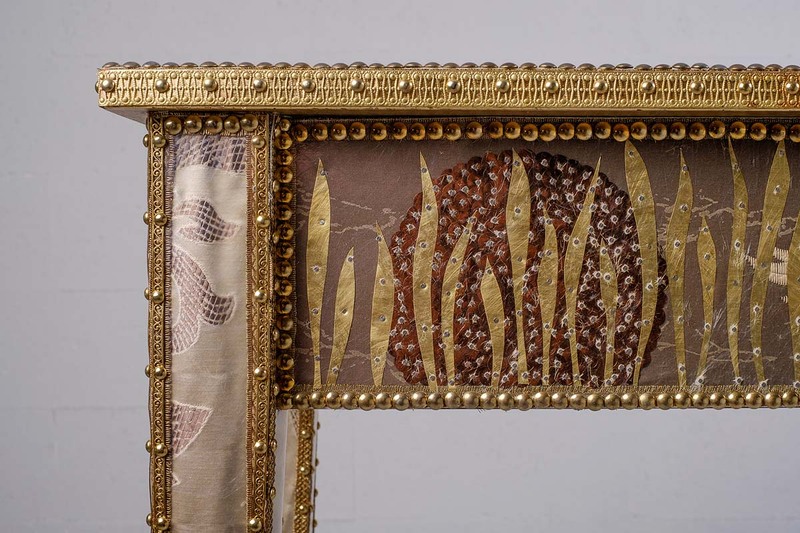 Wooden structure, fabric, metal and brass elements, sequins, fiberglass, trimming, nails and studs. 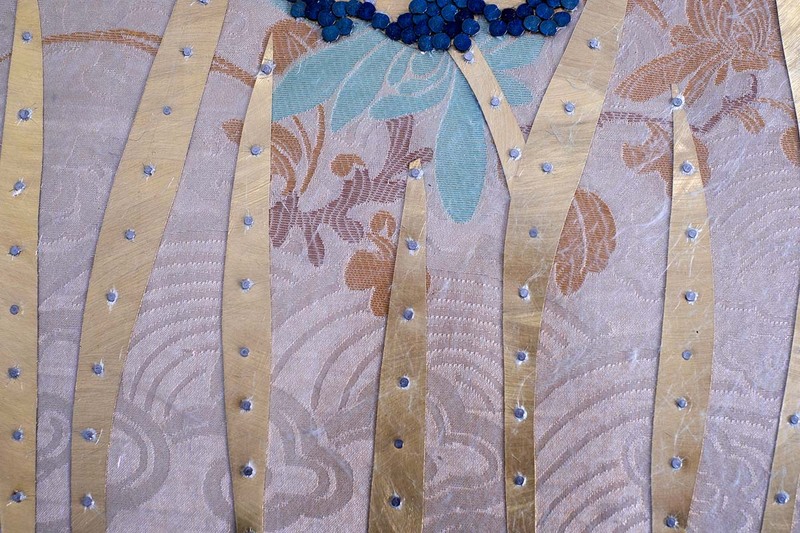 There was once shown the Amir slave-girl, who was excellently handsome and well-bred and an accomplished poetes; and he asked her of her name. 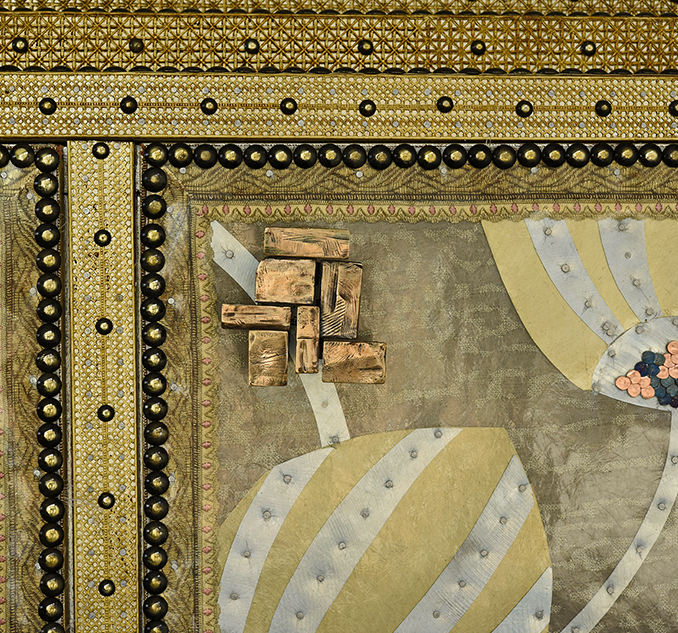 “May God advanced the Amir” replied she “My name is Munìs”. 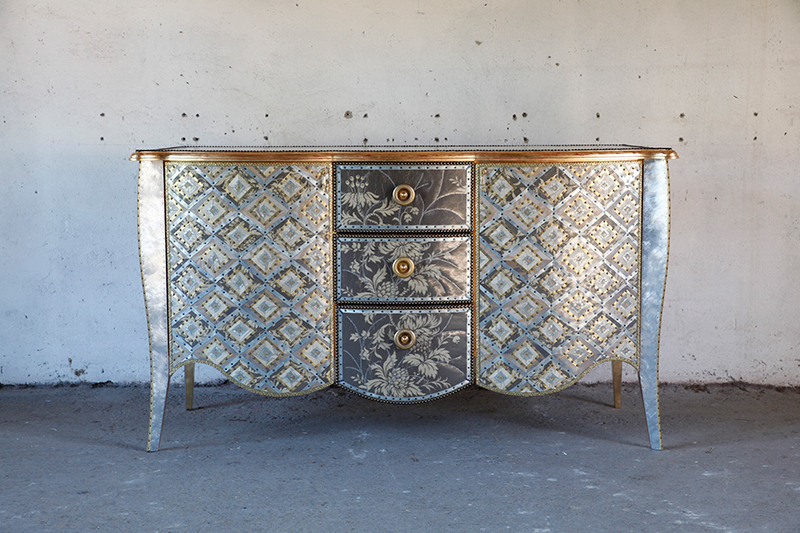 A refined and essential piece. 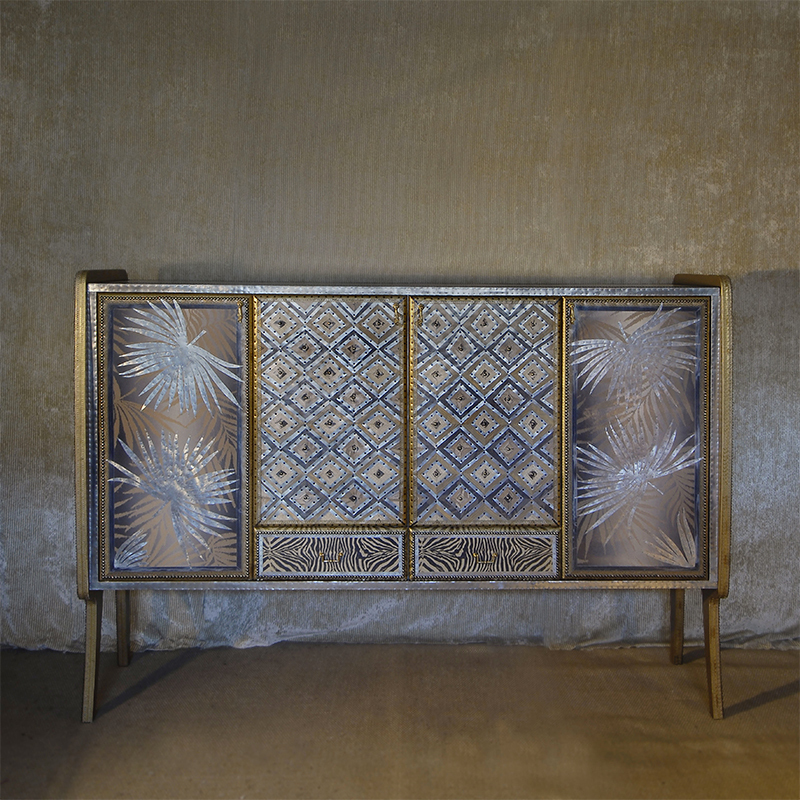 The geometric form evokes the atmosphere of the 30 s, with its decorative motifs shaped as big Kentia leaves, inspired by the liberty style. 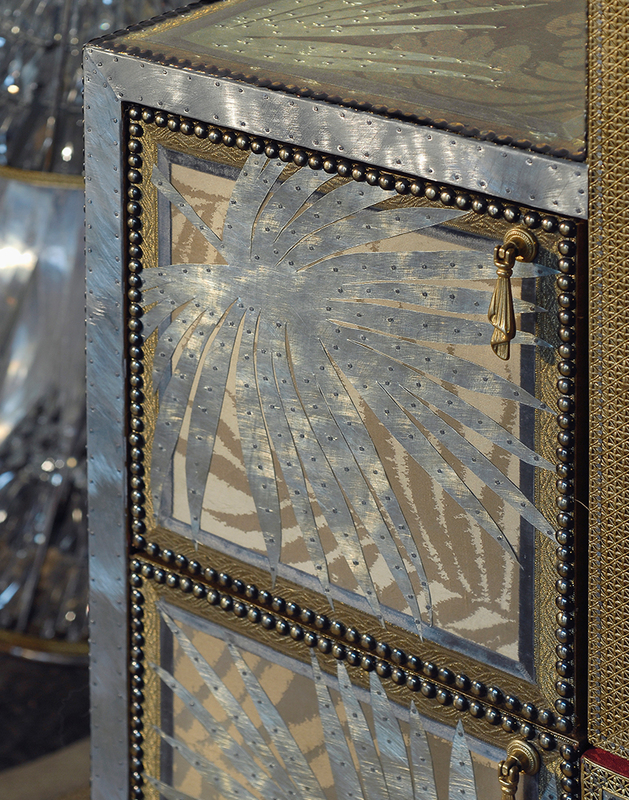 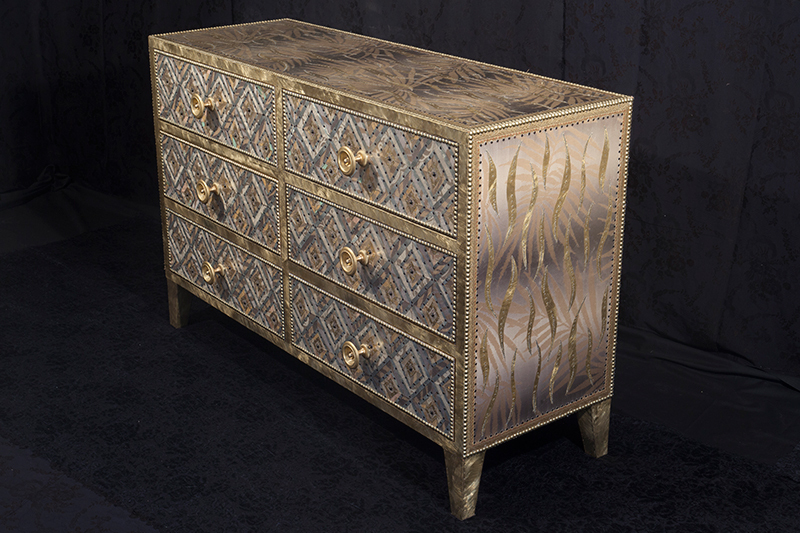 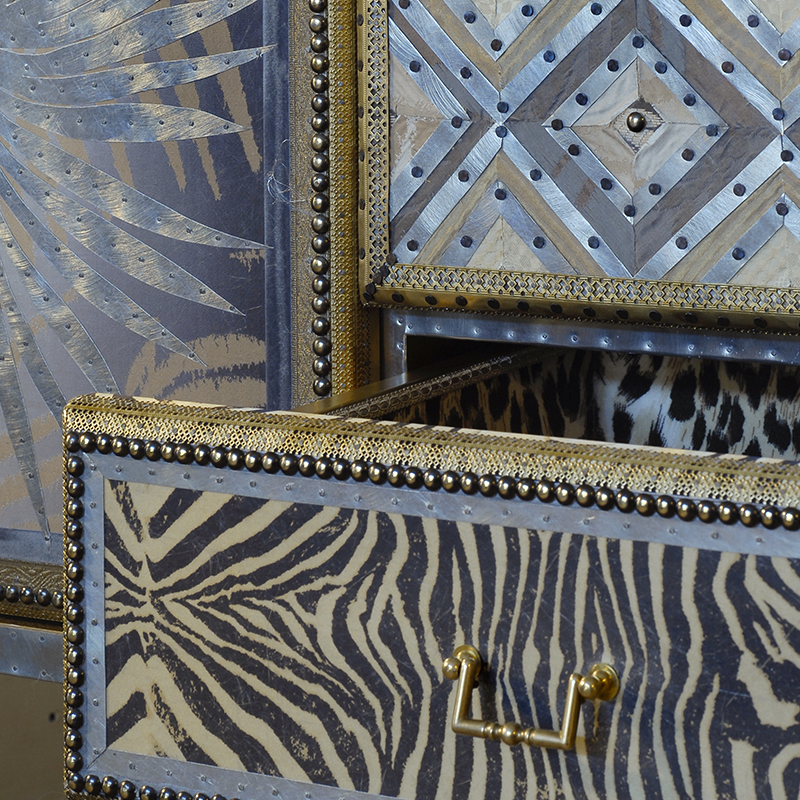 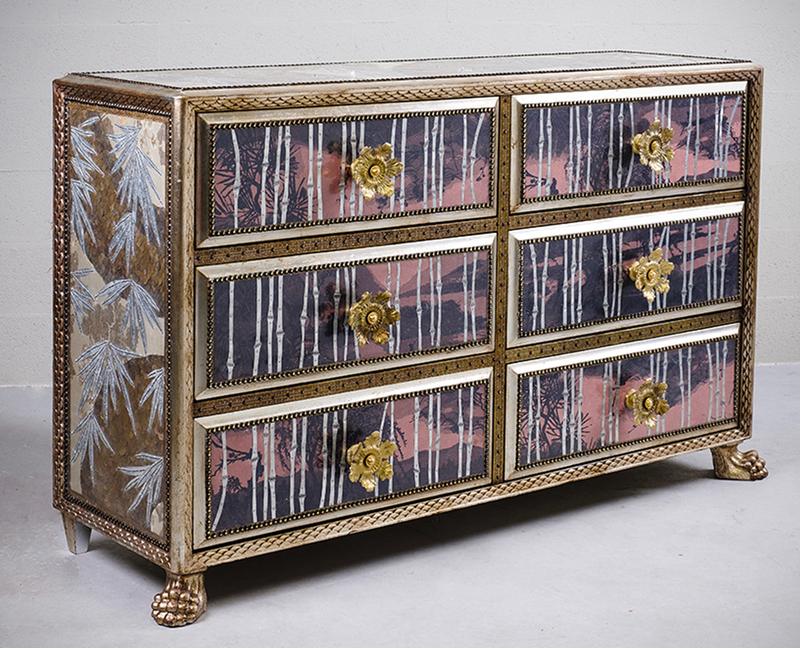 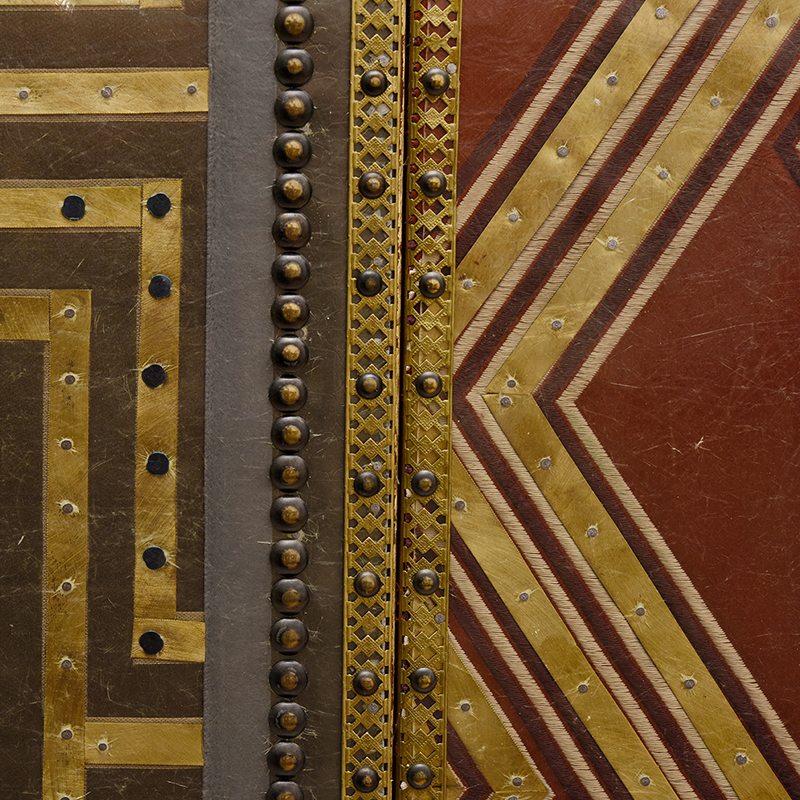 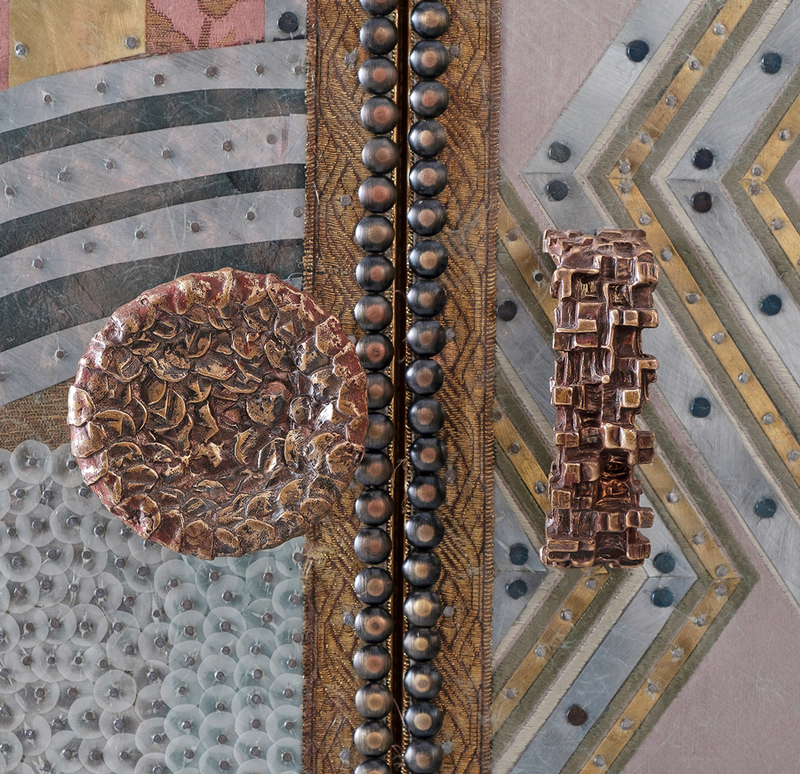 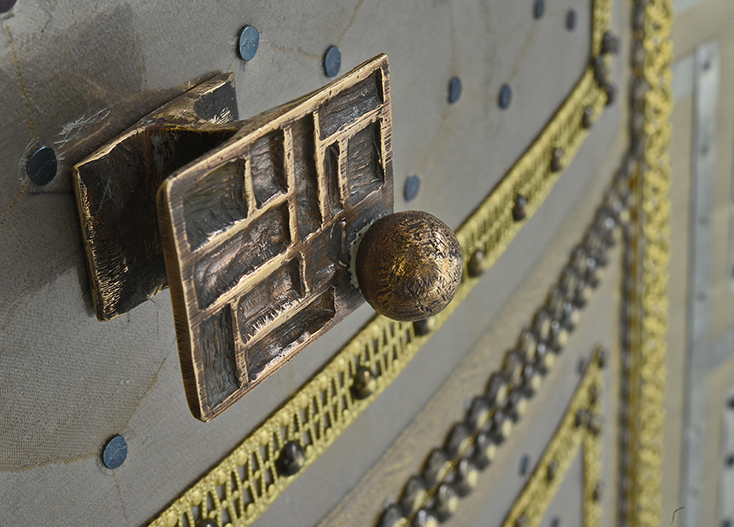 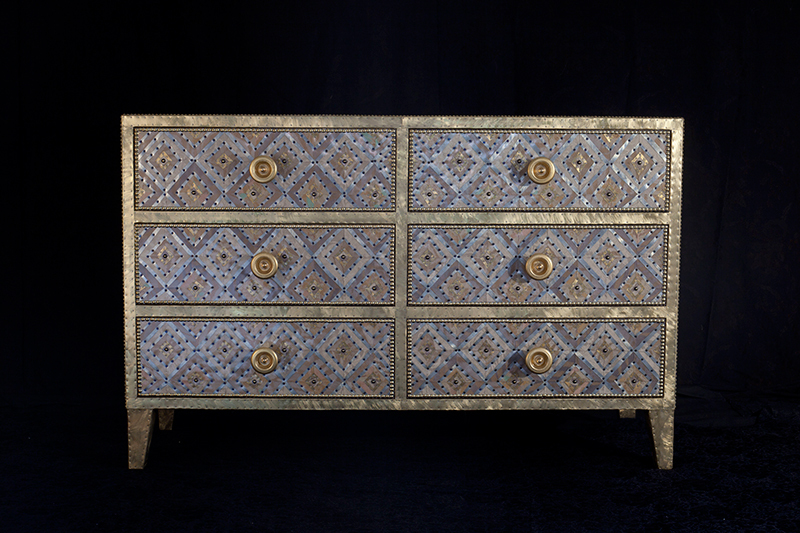 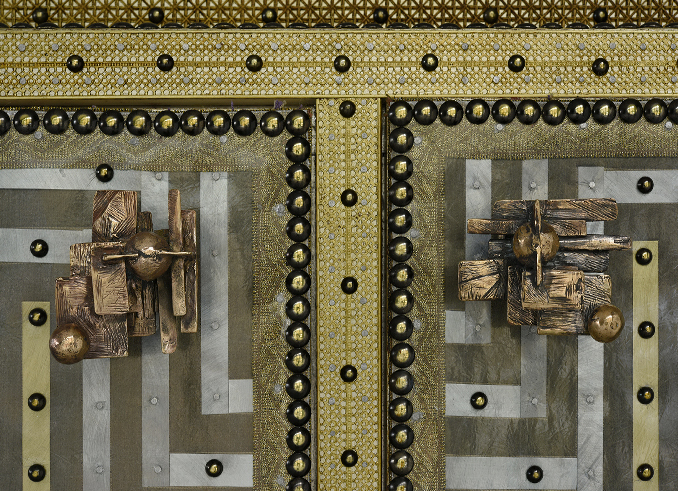 It is rich in details with exotic references, like the snake motif on the doors and the tigerskin on the drawers. 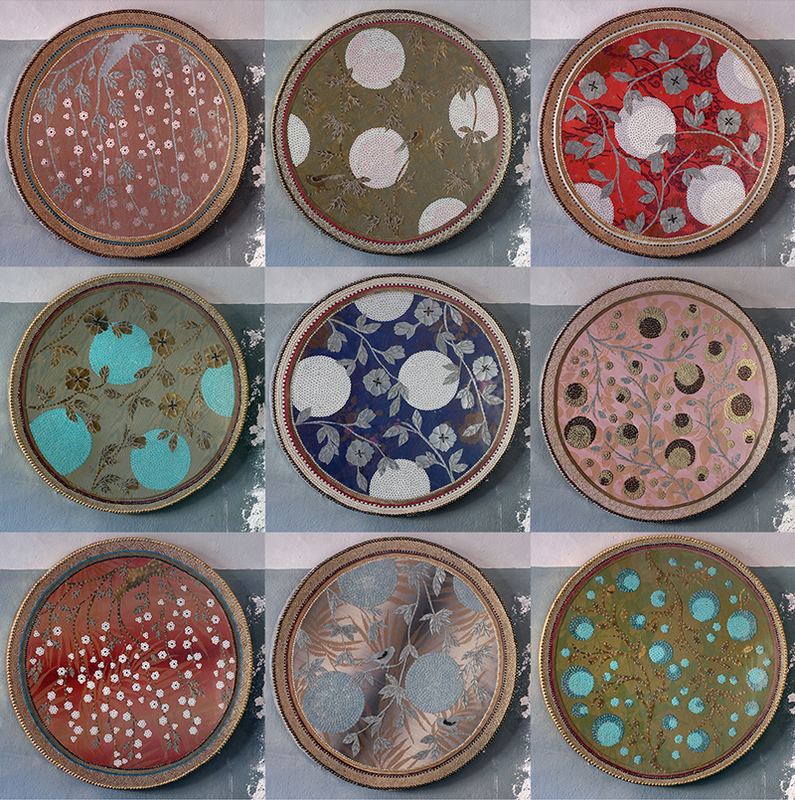 Several materials are used. 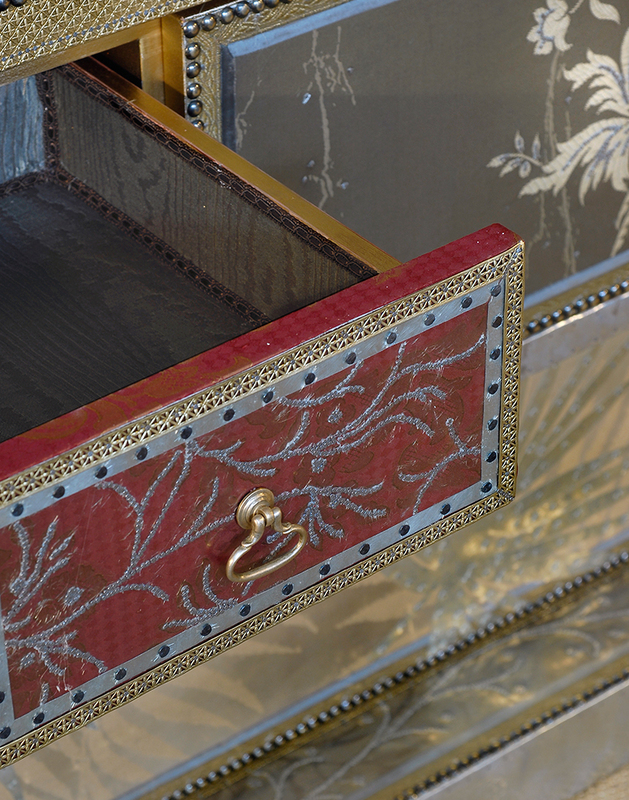 Wood is used for the structure and fabric, again with a Kentia leaf pattern dominating the decoration. 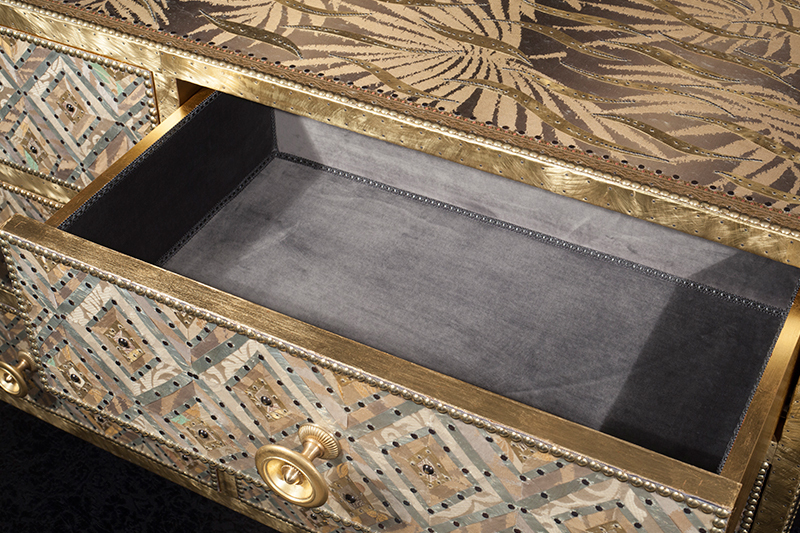 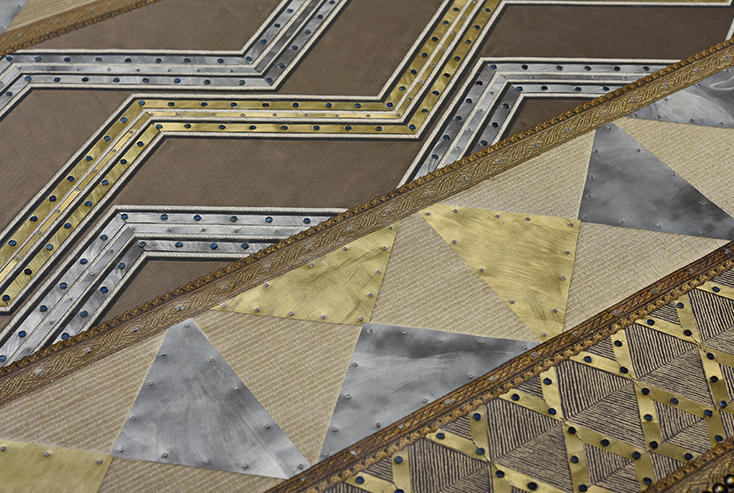 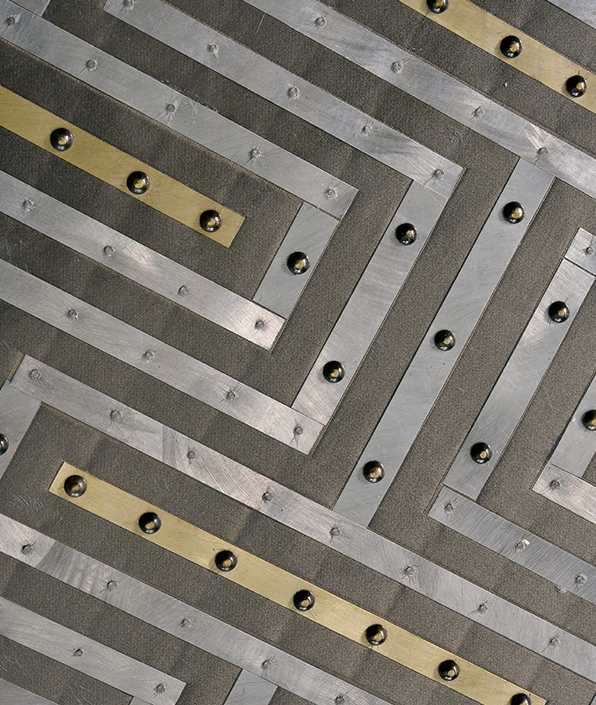 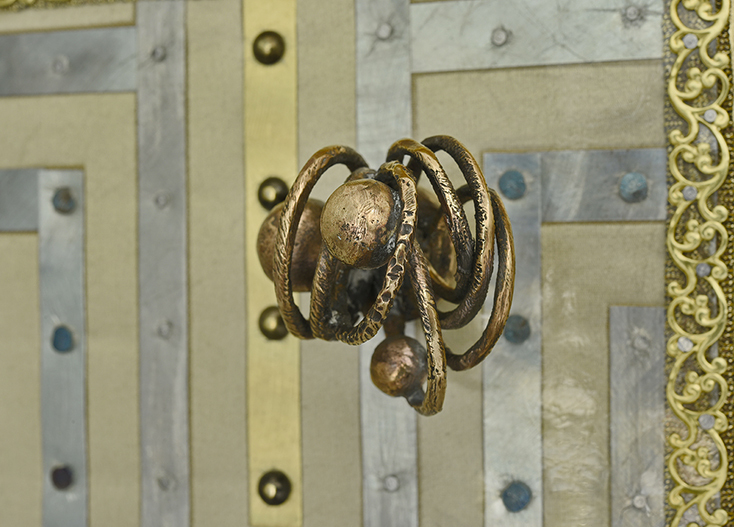 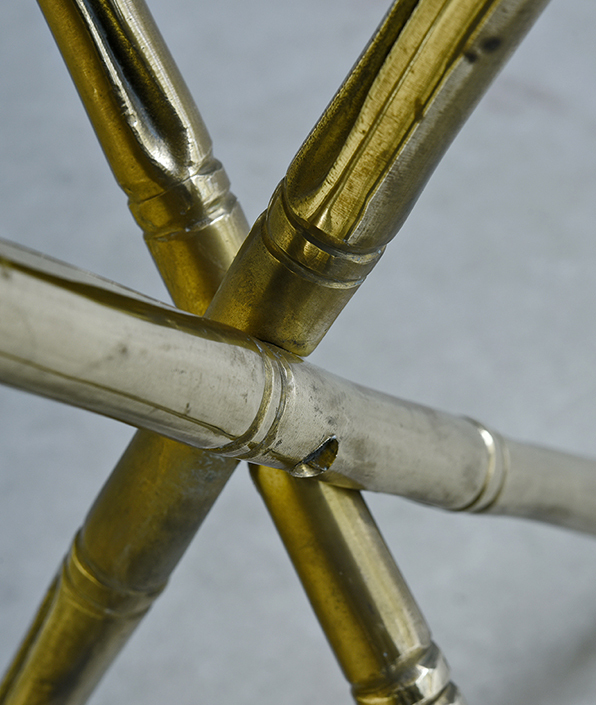 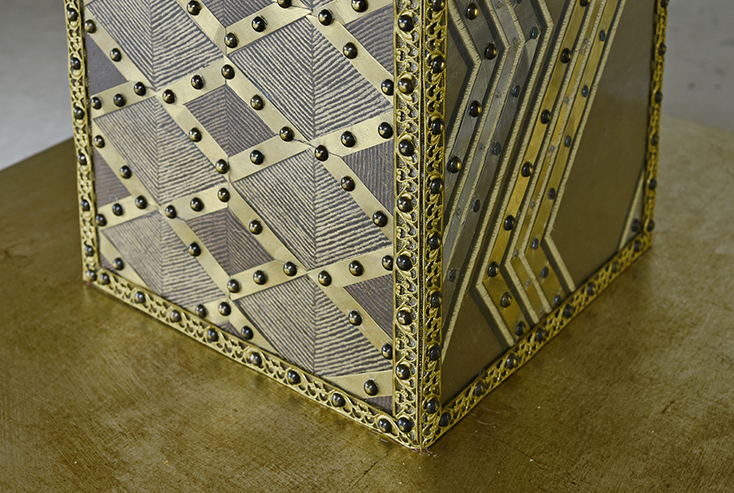 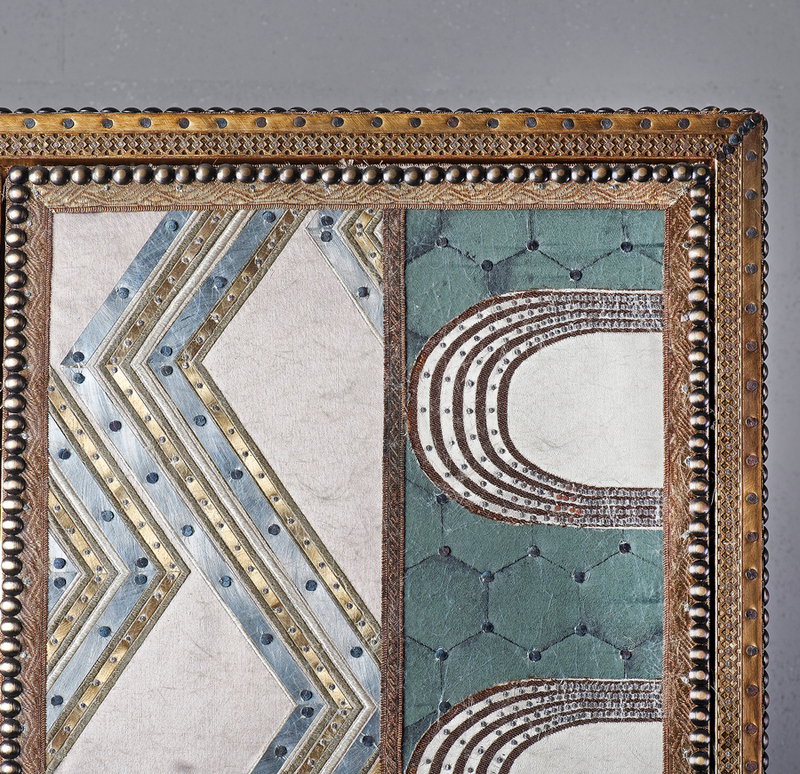 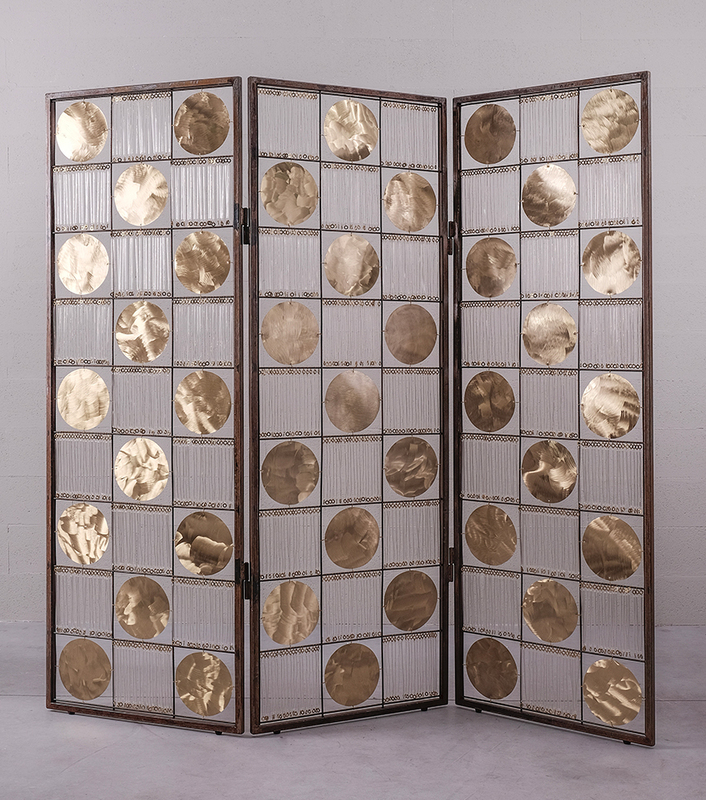 Brass and upholstery nails outline details, with fiberglass uniting fabric and metal. 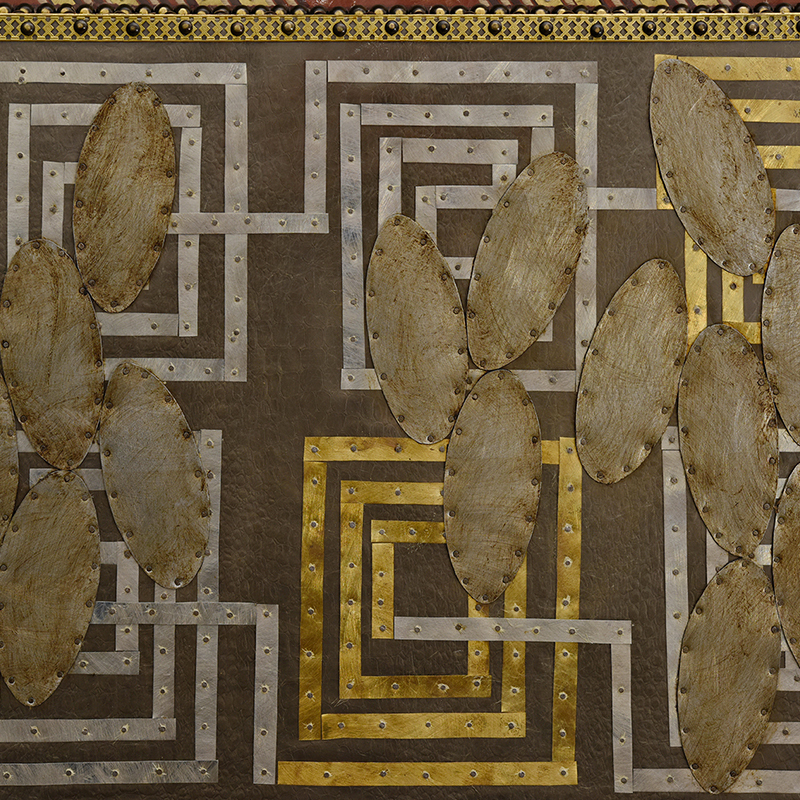 Finally, sellerine nails are hammered down one by one. 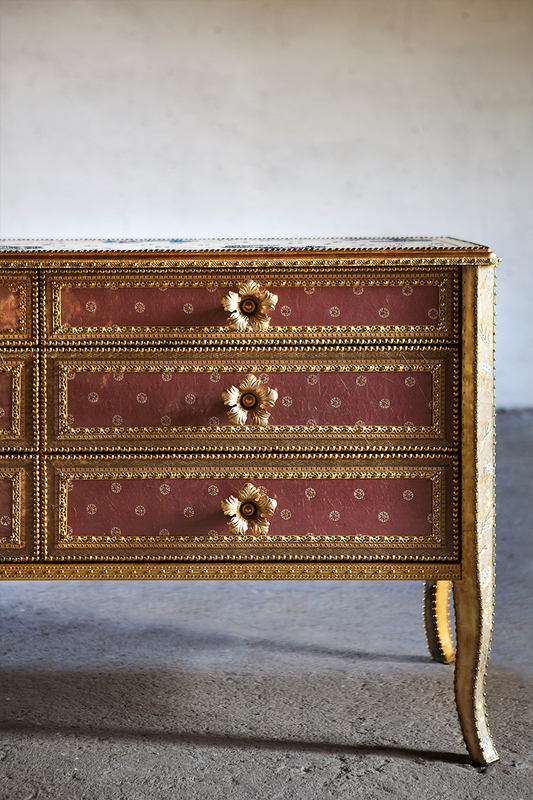 Inspired by the atmosphere of the beginning of the Eighteenth century, Il Commendatore is an imposing yet delicate and poetic buffet. 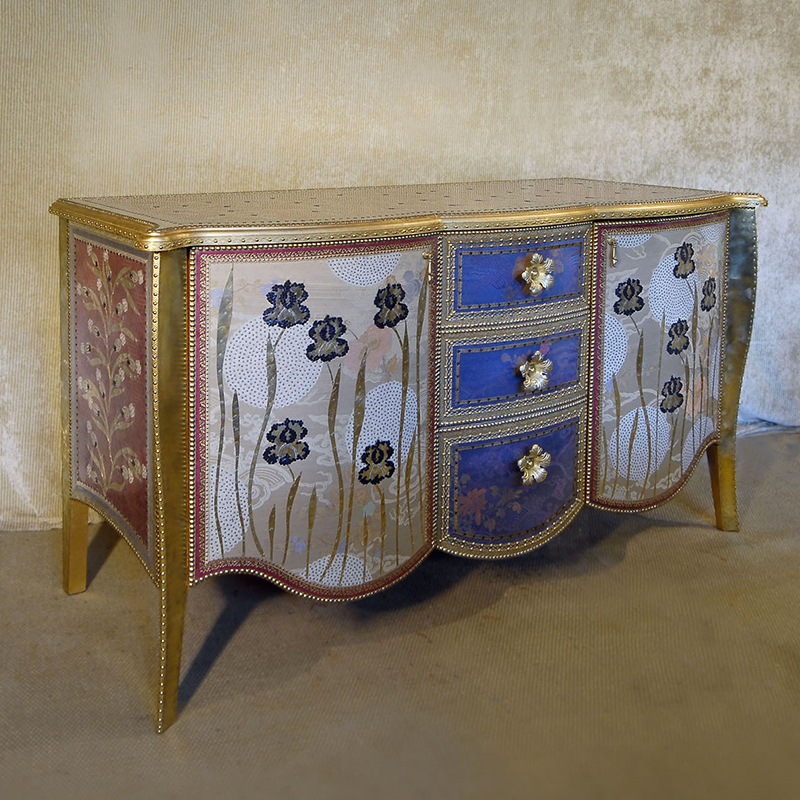 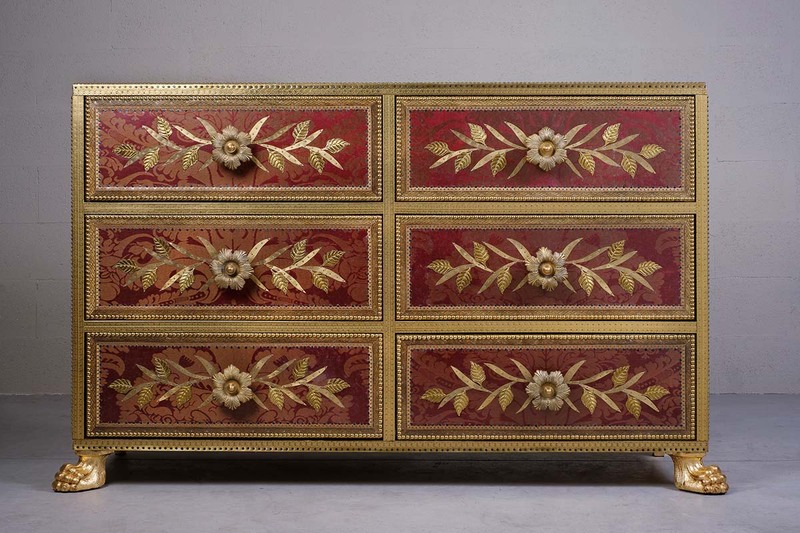 This is thanks to the rounded style of the doors and top, the flower shaped handles of the drawers, and above all the floral decoration, realized with iris and brass leaves overlapping a fabric embroidered with a delicate motive. 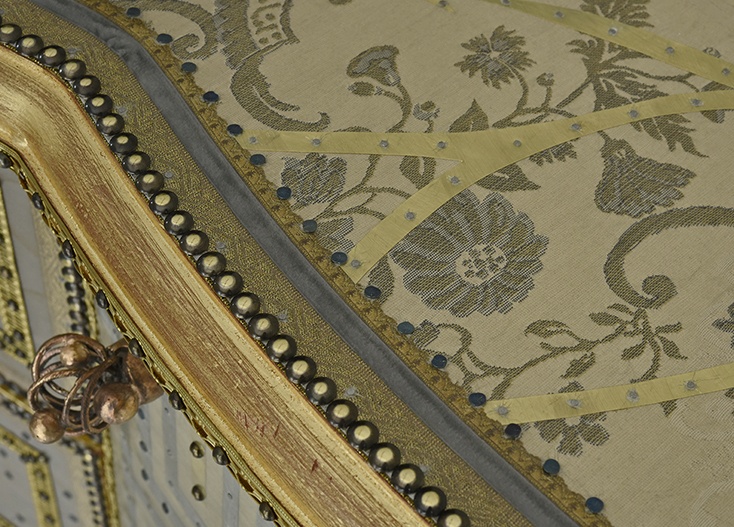 The top and the sides are decorated with 78 flower buds hammered over a purple fabric. 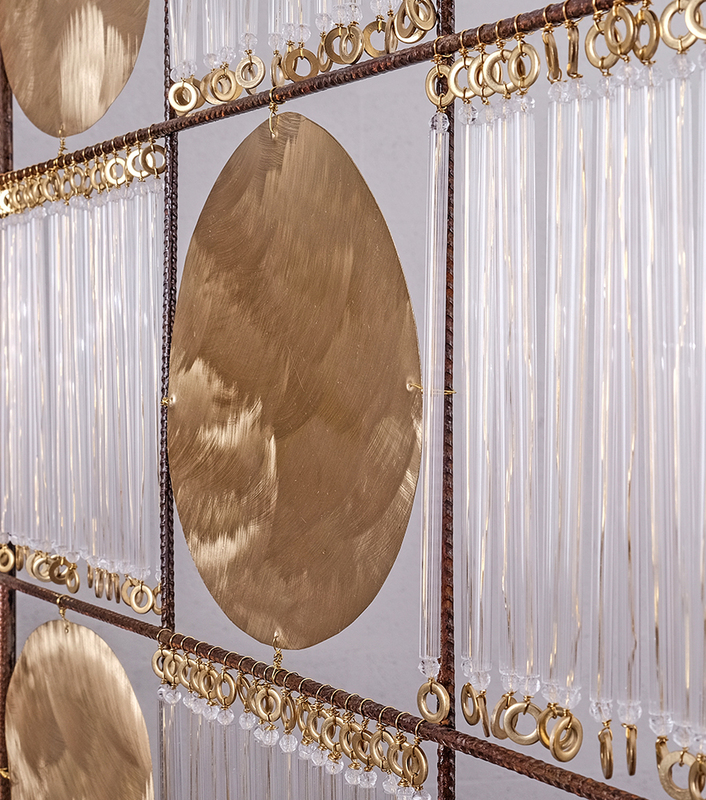 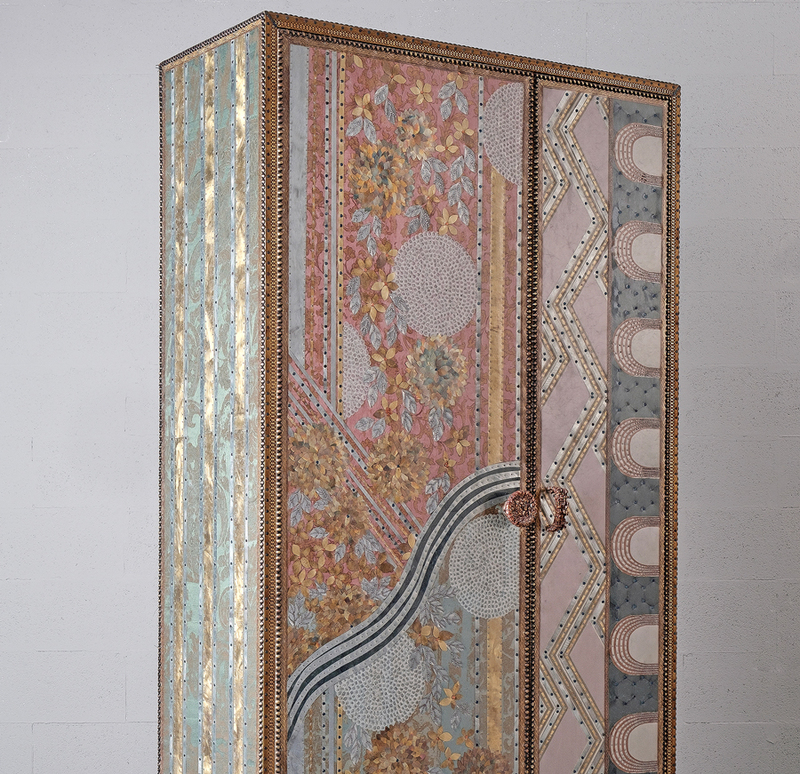 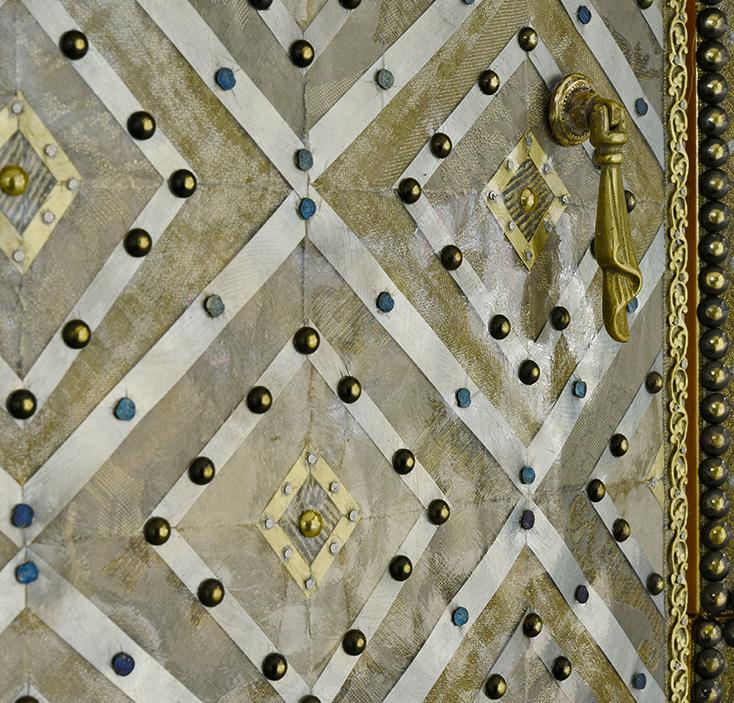 The doors are decorated with 8 pale moons made with 4.442 sequins. 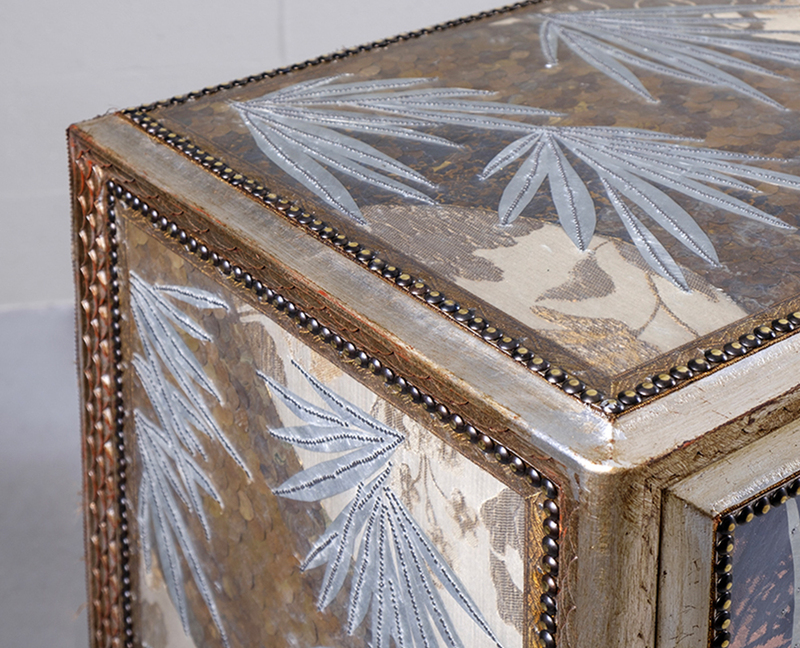 Brass and upholstery nails outline details, fiberglass unites fabric and metal, and of course sellerine nails are hammered down one by one. 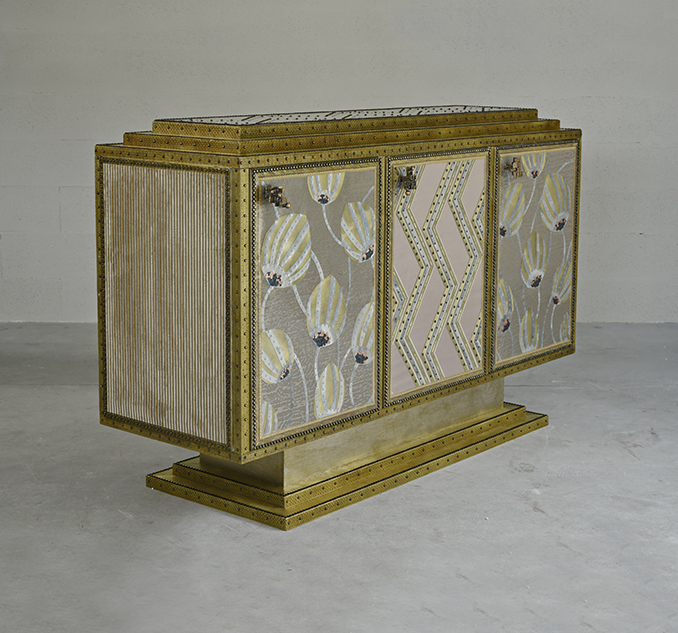 Chest of drawers with a sober and contemporary shape, geometric decorations in pale colours, and a Kentia motif fabric. 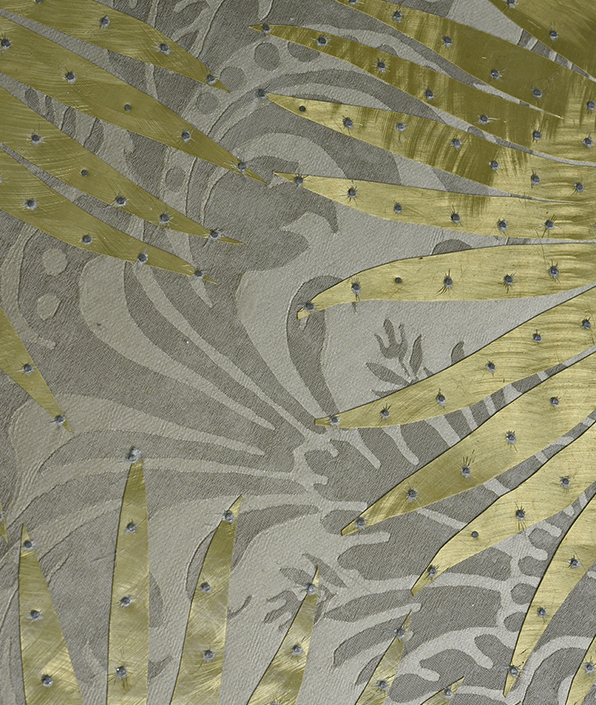 The snake motif consists of a reinterpretation of an antique African fabric and its surface, rich in metal insertions, is very sensitive to light. 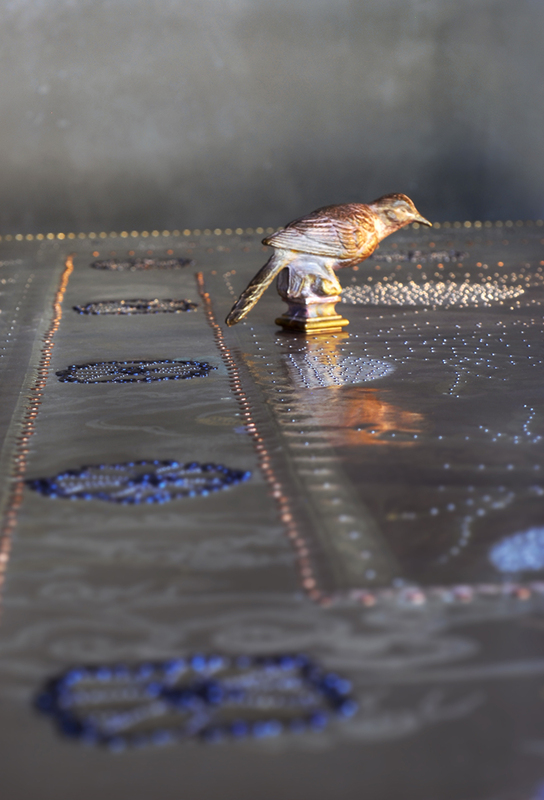 Its realization, completely handmade, required 30,000 hammer blows. 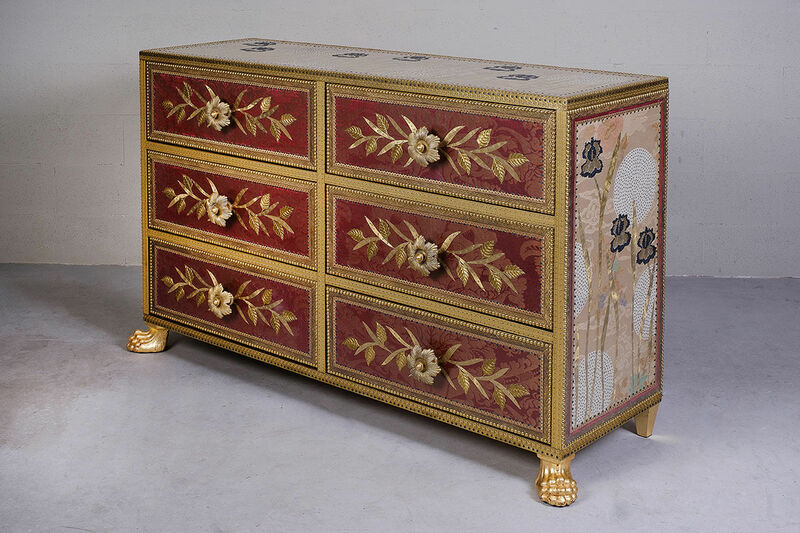 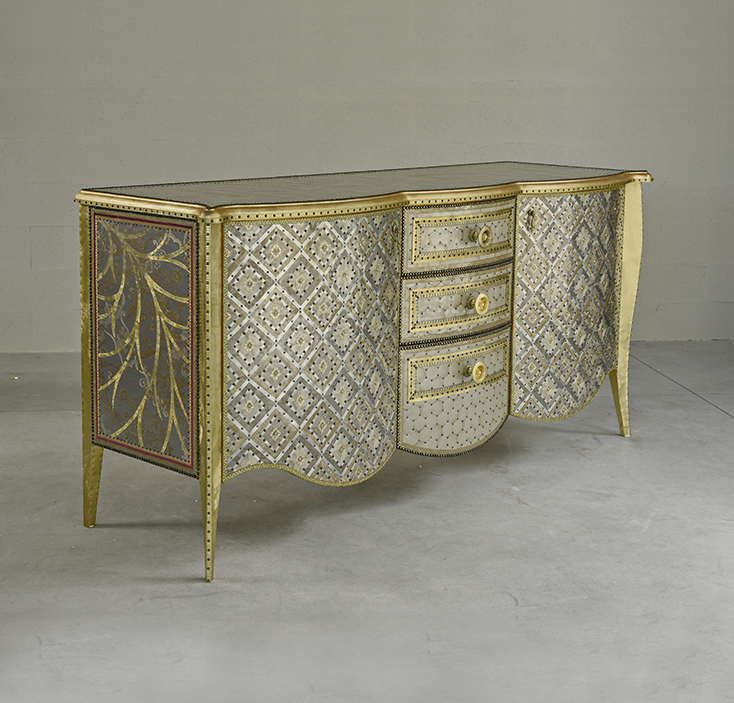 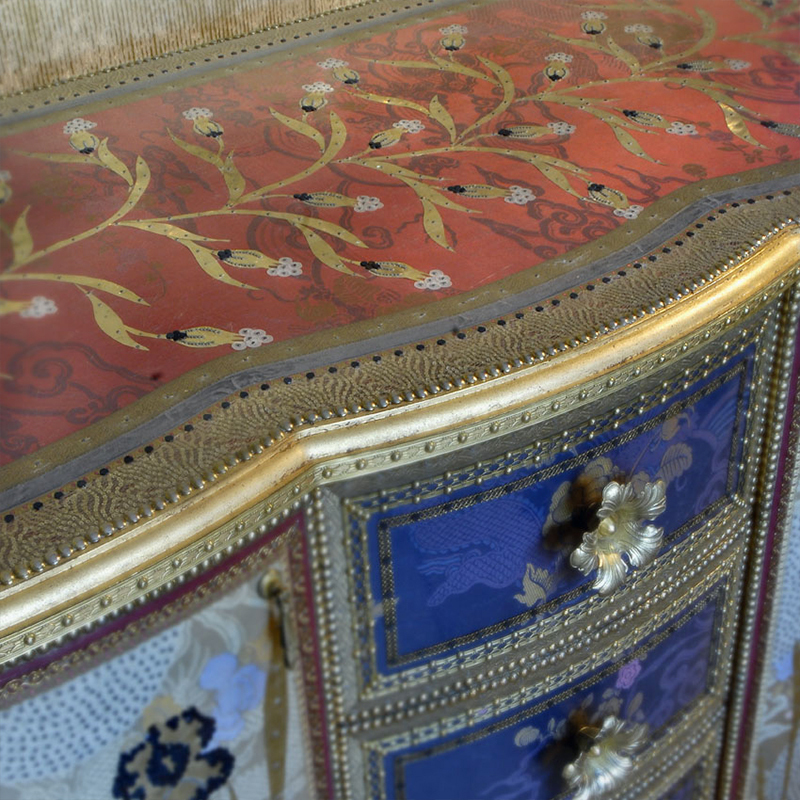 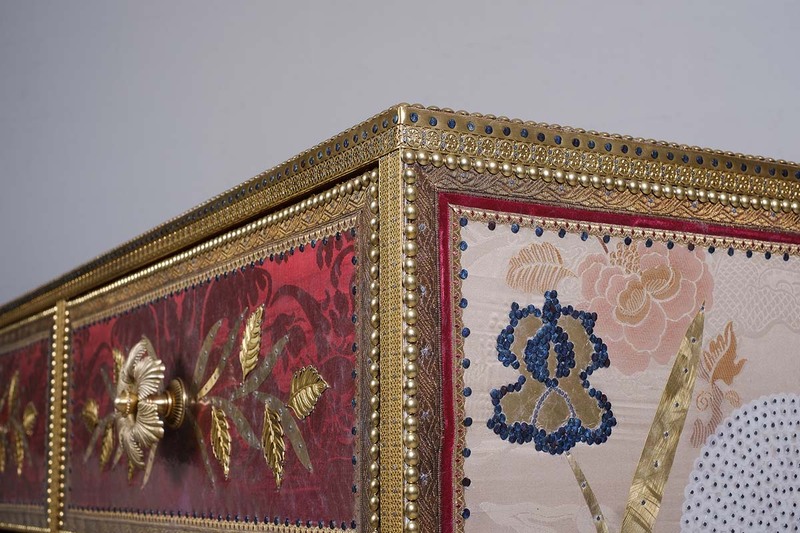 Reminding the atmosphere of the beginning of the Eighteen century, the furniture is refined by the flower shaped handles of the drawers as well as the top and the sides which are decorated with brass flowers and sequins. 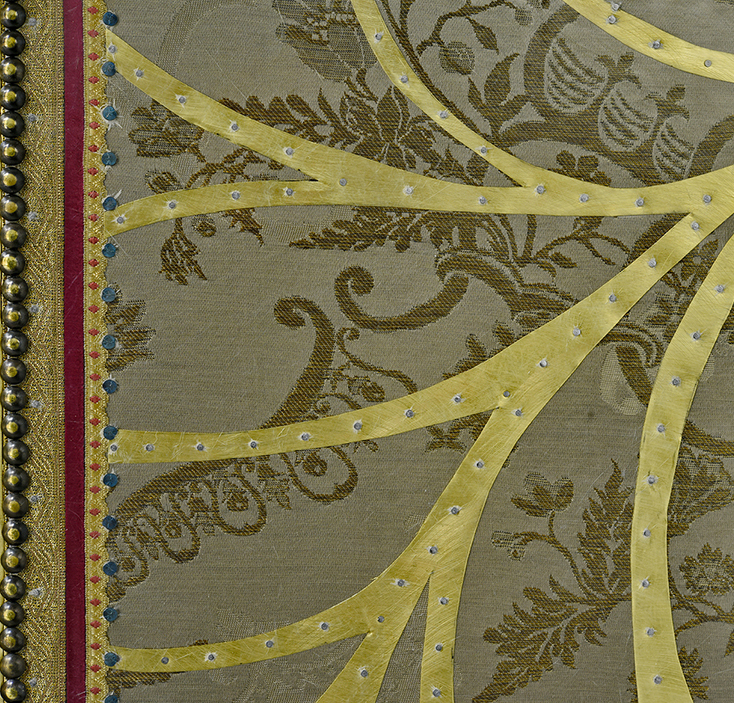 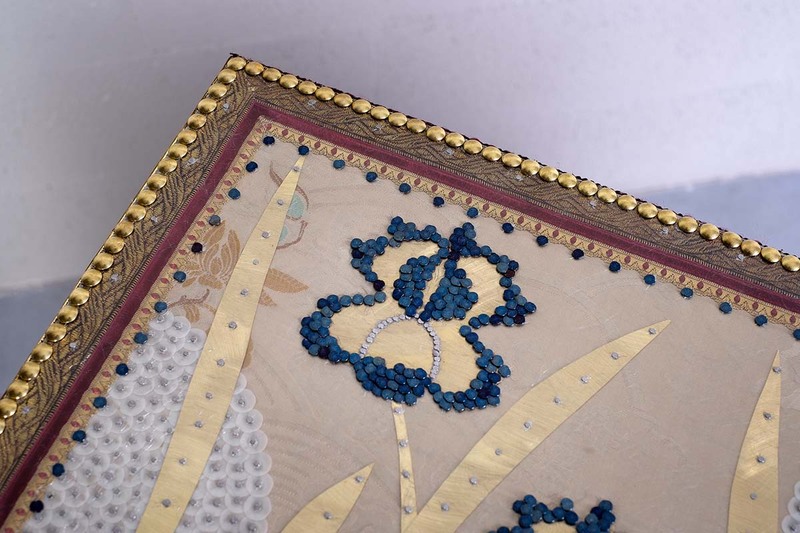 The strong colour of the front side is intensified by the brass frames and small gold flowers. 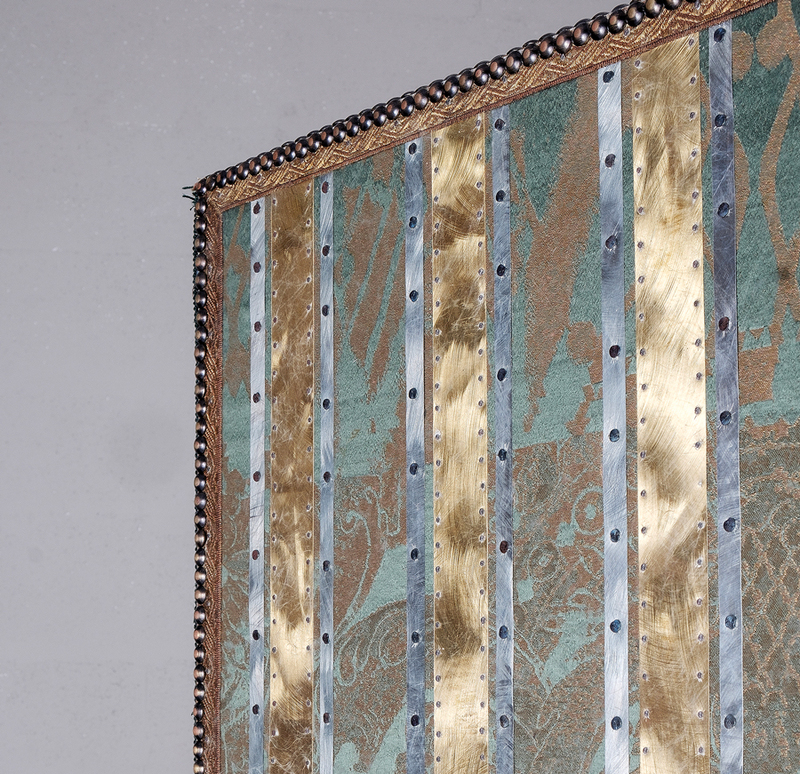 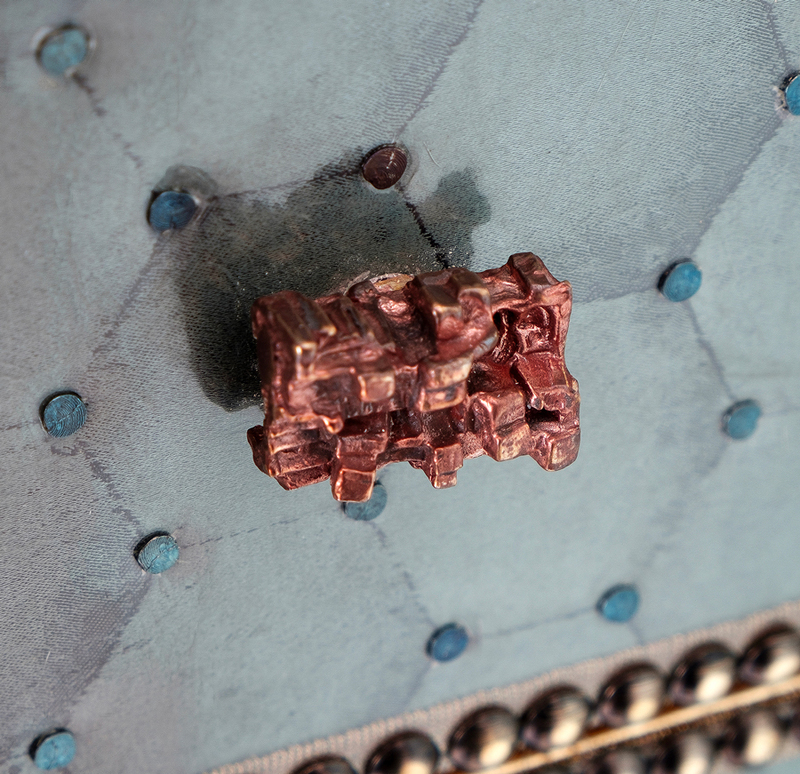 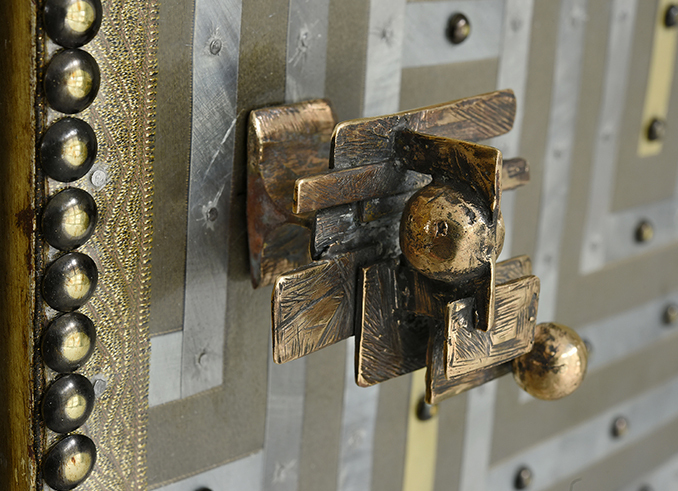 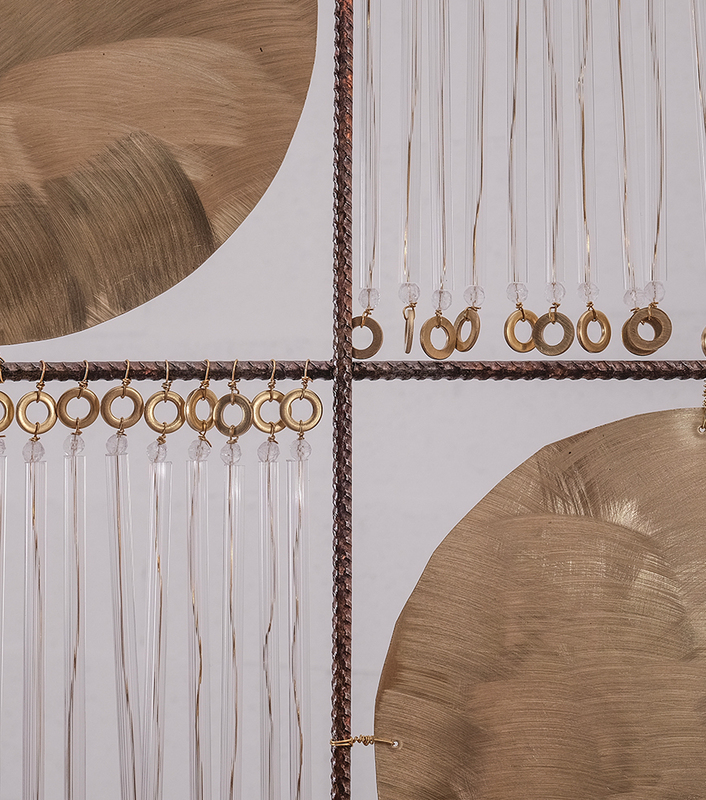 The use of brass and studs as details, the fiberglass as trait d’union between fabric and metal as well as the hand-crafted aspect is underlined by the use of nails hammered down one by one. 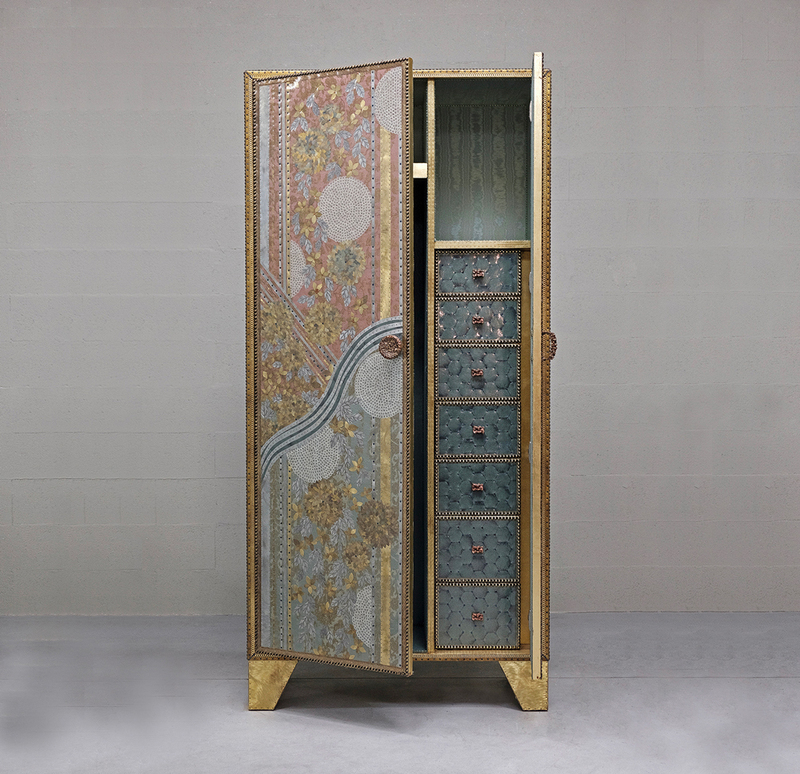 Being inspired by the beginning of the 1700s atmosphere, Il Commendatore, is an impressive but at the same time delicate buffet thanks to the rounded shape of the top and of the doors. 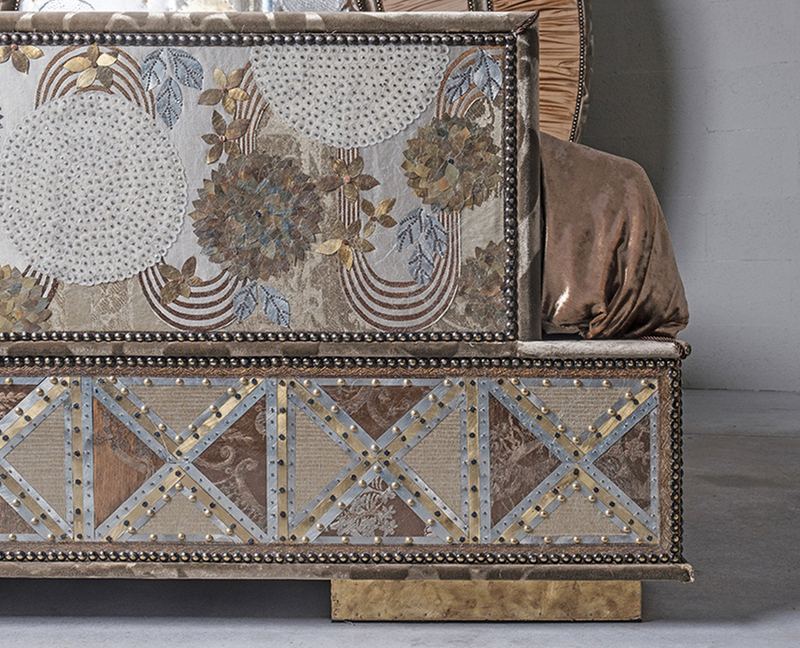 The decoration of the furniture’s doors is inspired by the pattern of an African fabric while the flowers get the furniture soften. 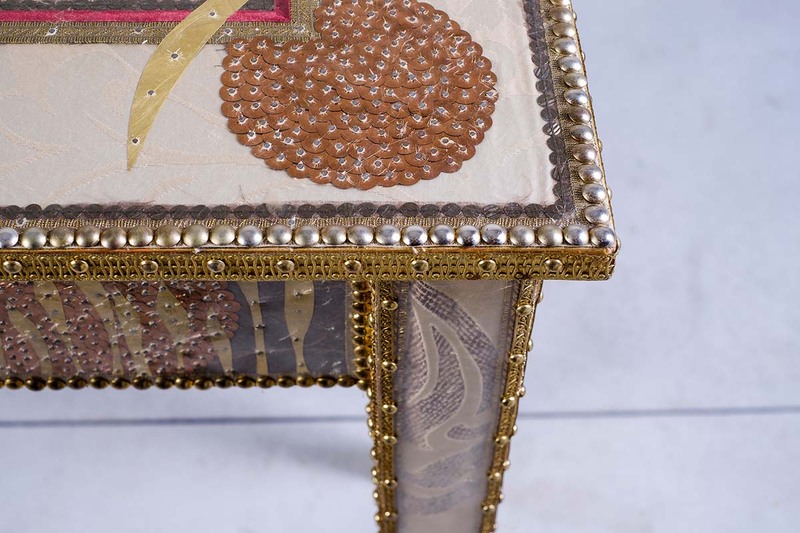 The use of brass and studs as details, the fiberglass as trait d’union between fabric and metal as well as the hand-crafted aspect is underlined by the use of nails hammered down one by one. 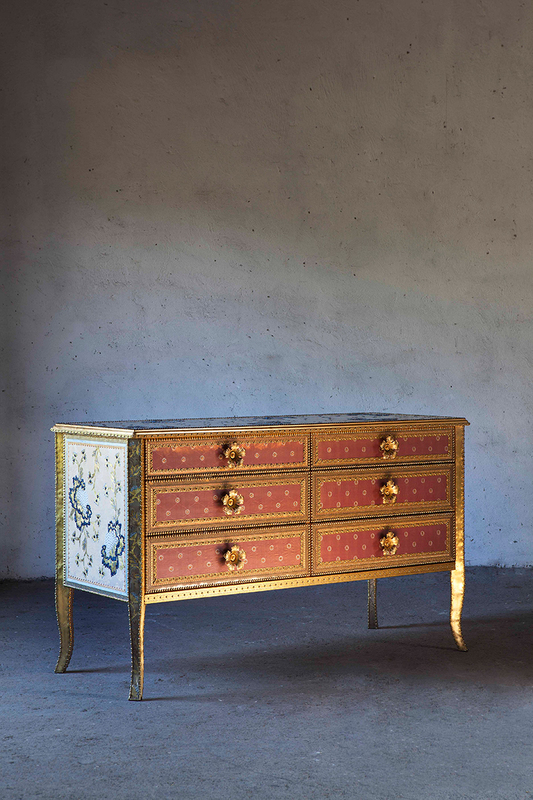 This six drawers furniture is characterized by strong and warm colours. 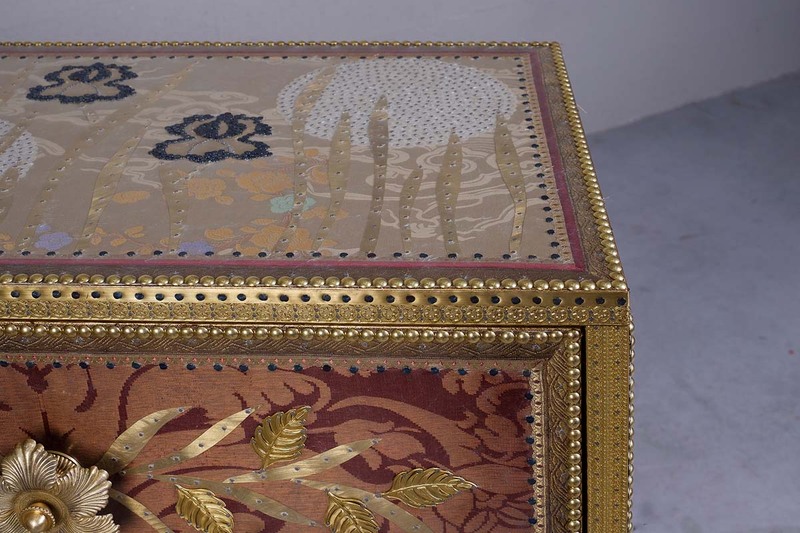 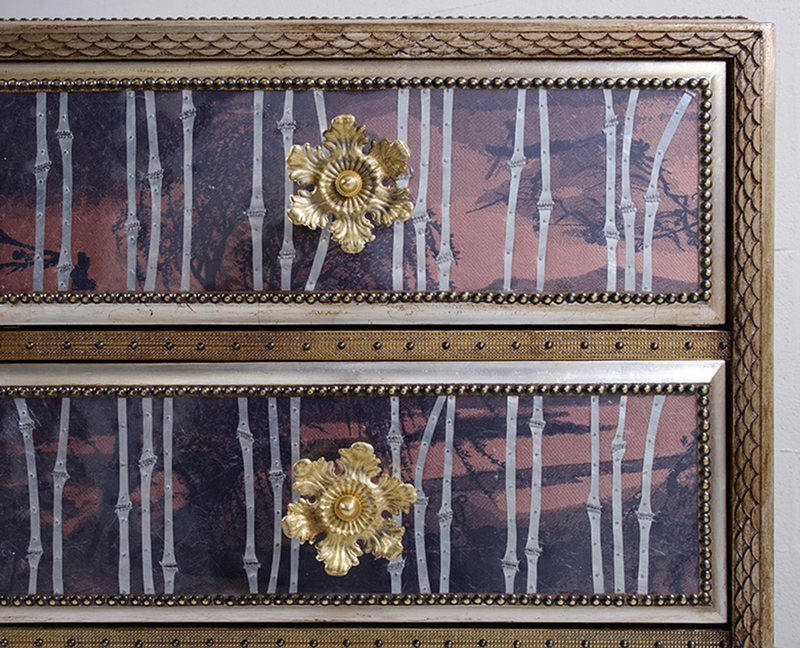 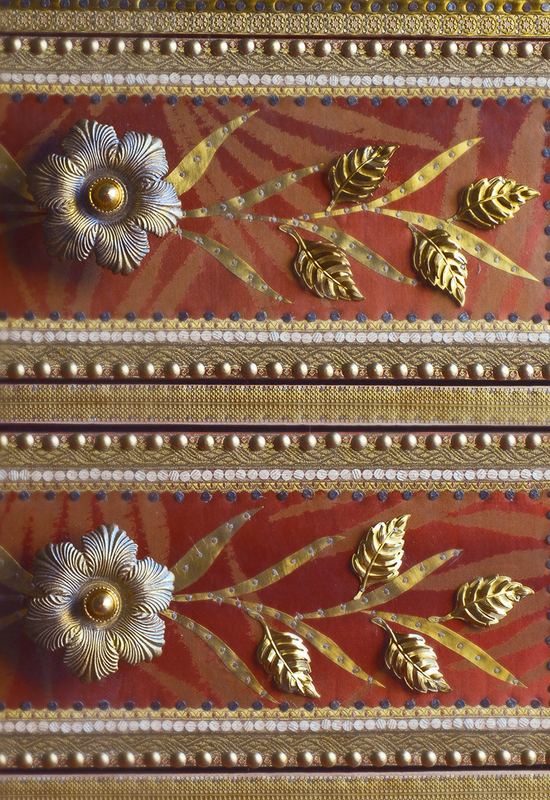 The purple-red texture that cover the front side is intensified by the brass flower shaped handles and by the embossed branches with golden leaves. 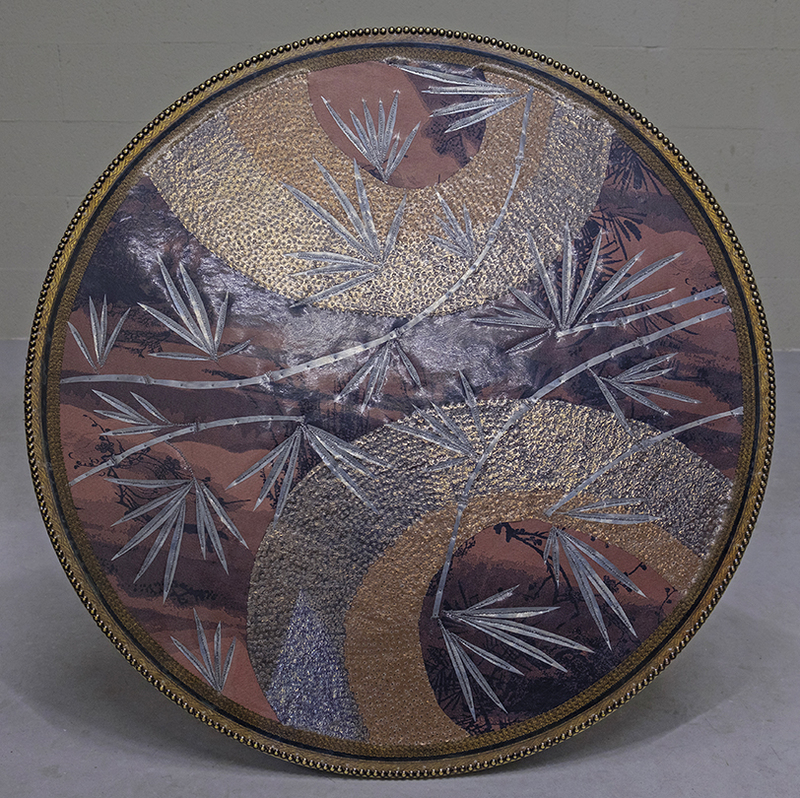 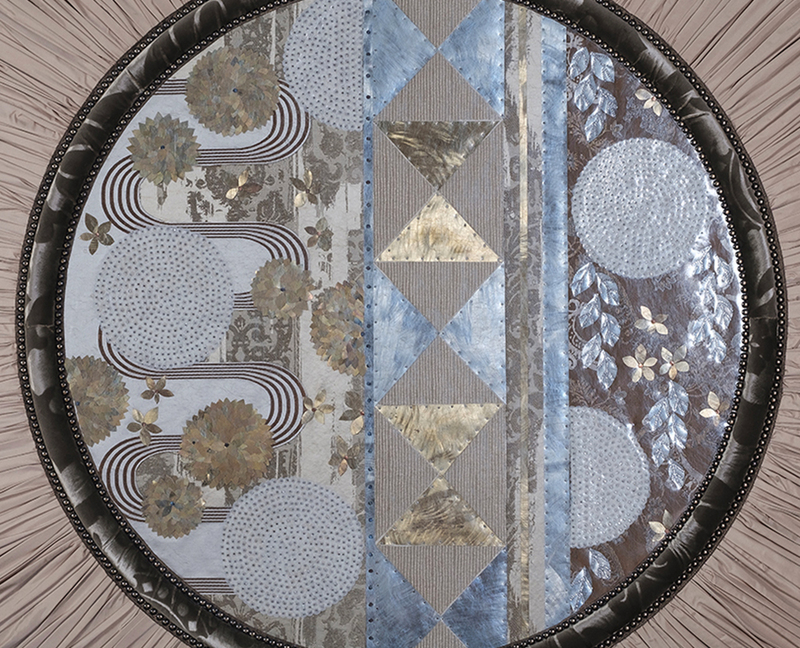 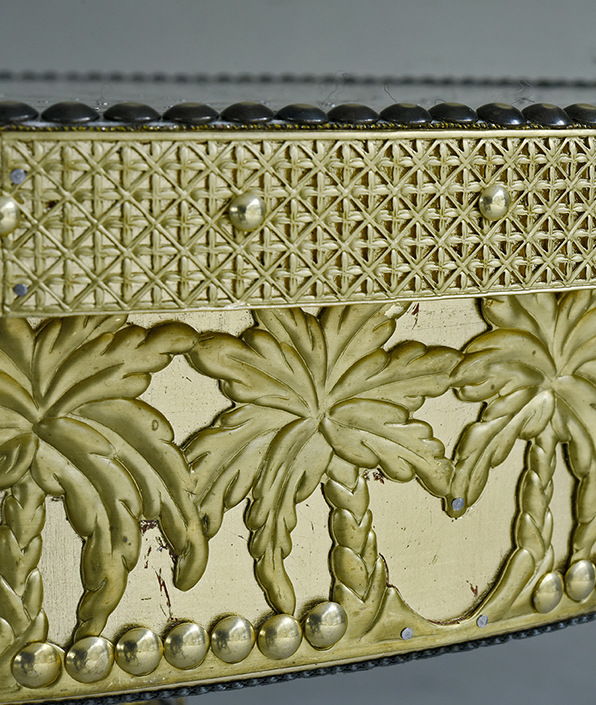 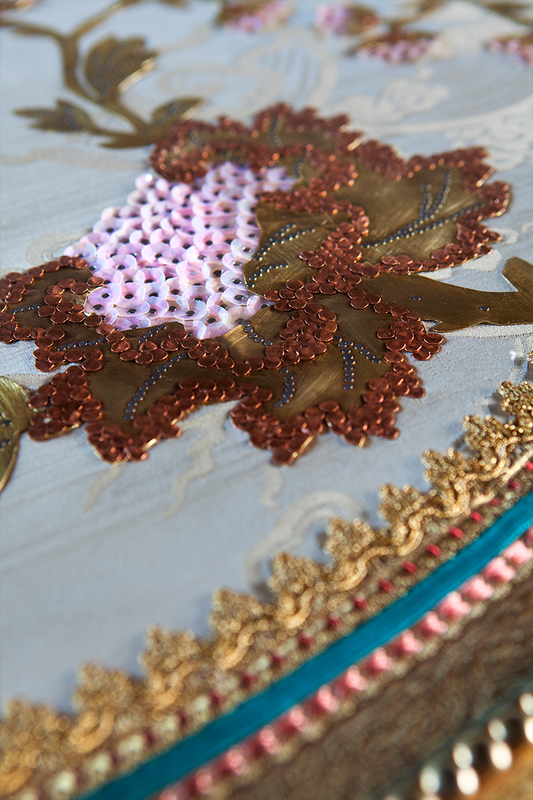 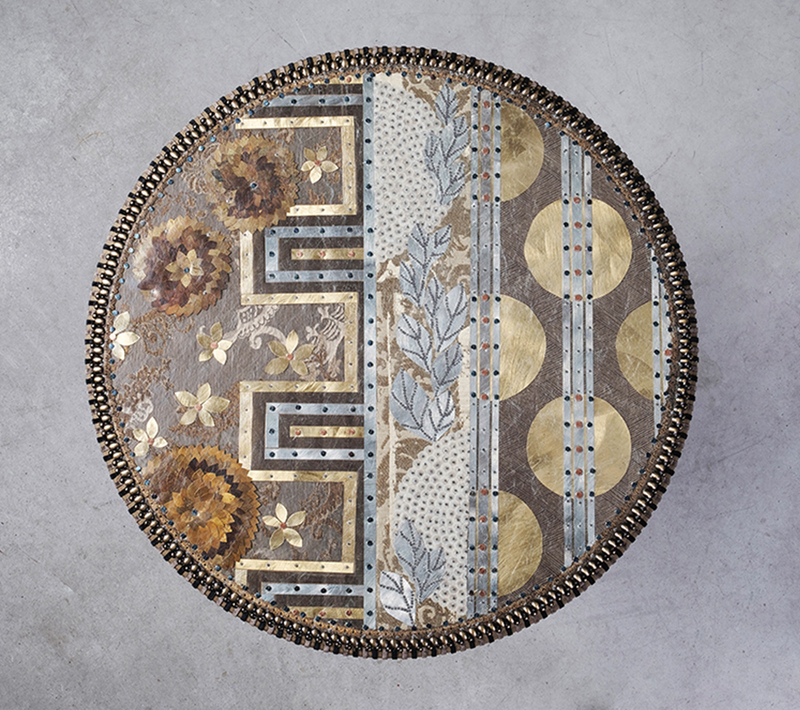 The top and the sides are decorated with brass and sequins shaped as pales moons, Iris flowers and blades. 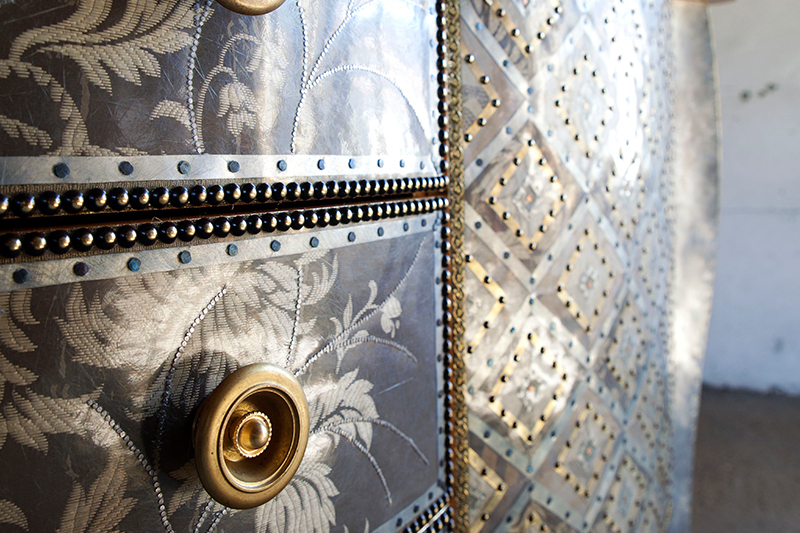 Studs and trimmings for the details, fiberglass as trait d’union between fabric and metal and nails which are hammered down one by one. 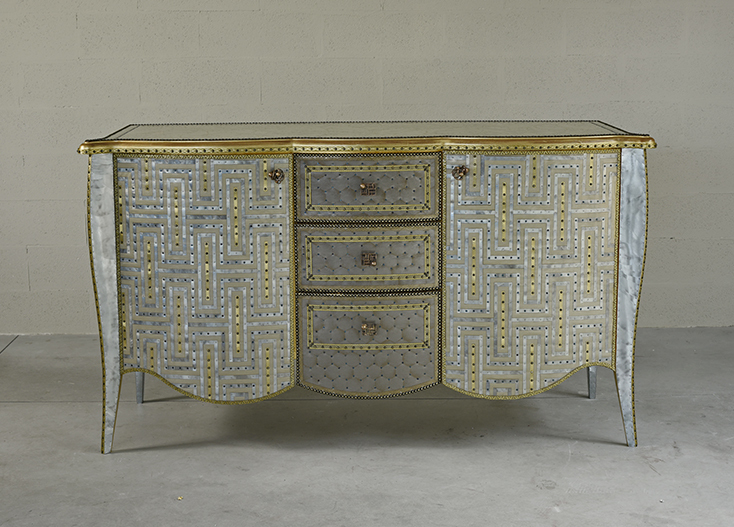 Impressive and austere furniture reminds the atmosphere of the 1930s. 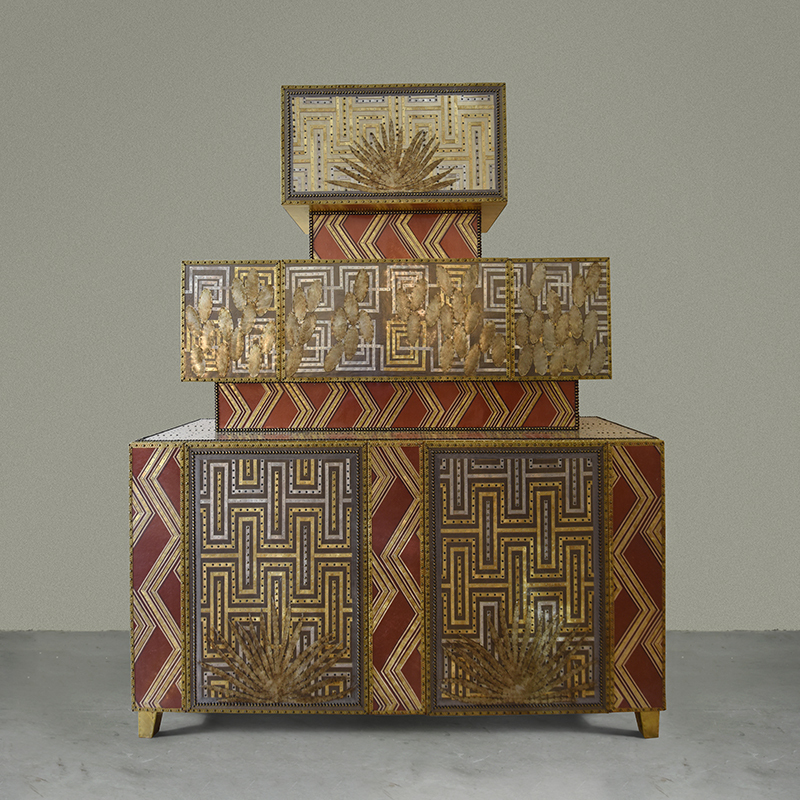 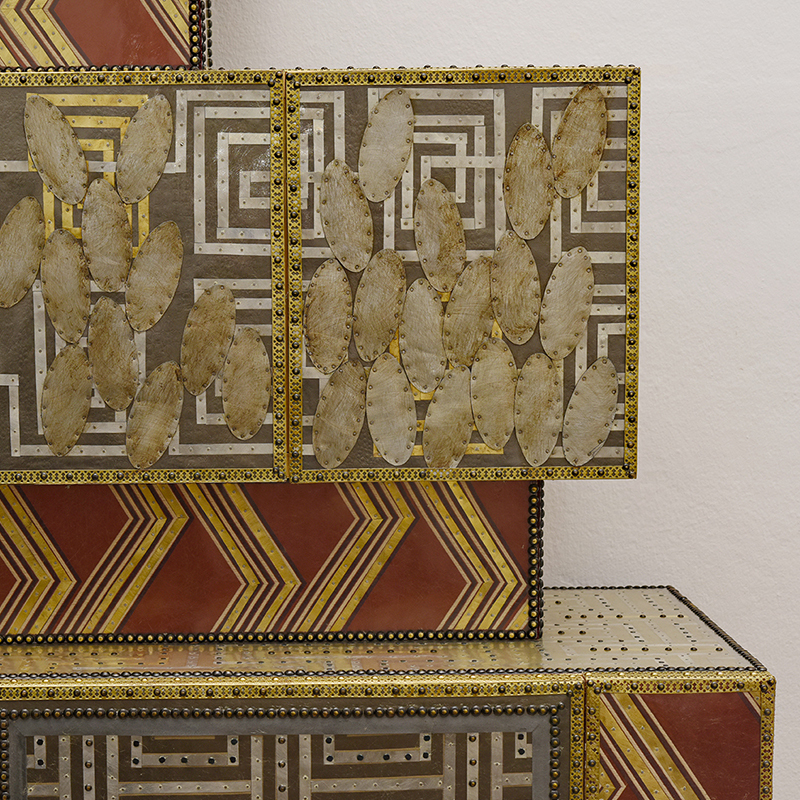 Its shape is squared and unusual, its doors and drawers are decorated with geometrical shapes inspired by the pattern of an African textile which contrasts with the big Kentia liberty leaves. 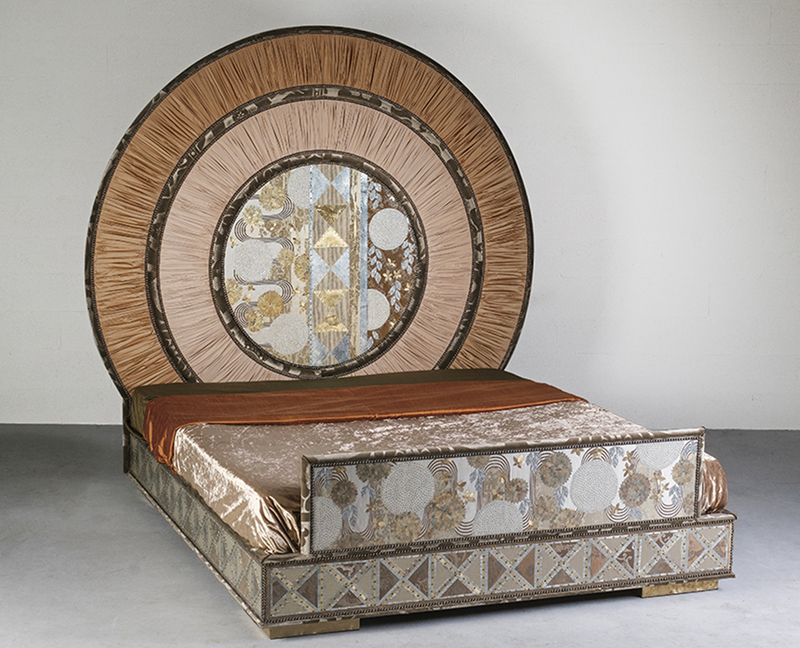 Cocteau is characterized by an undeniable visual impact which can give distinctiveness to a traditional or modern space. 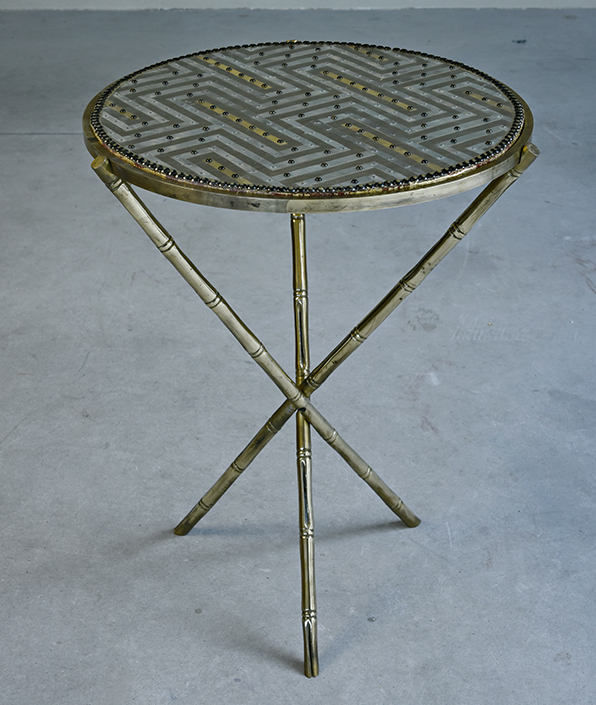 A classic table, made contemporary by decoration with fabric, metal, upholstery nails, sellerine nails and fiberglass. 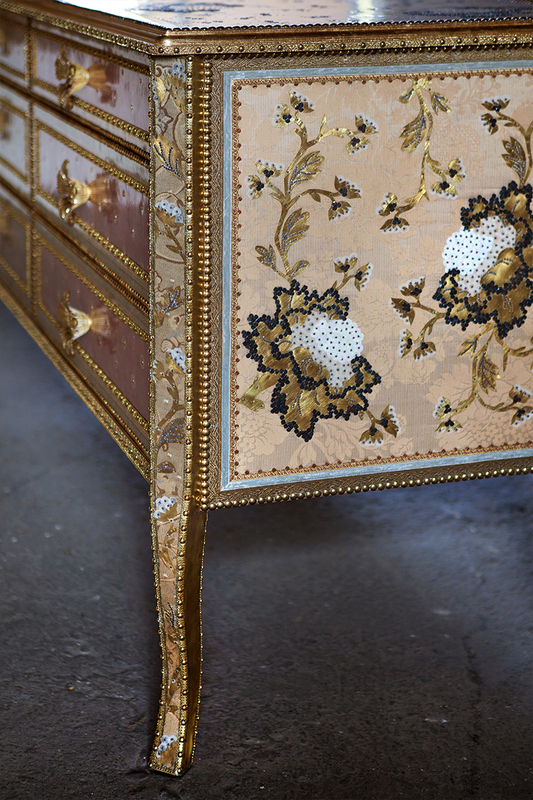 This is an original and sophisticated technique that turns a traditional piece into an object of rare beauty. 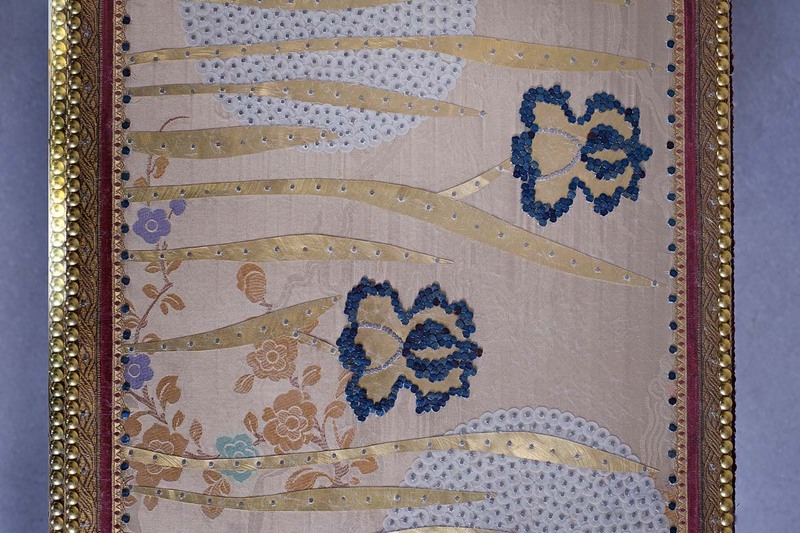 Floral motifs are handmade with sequins and brass patterns. 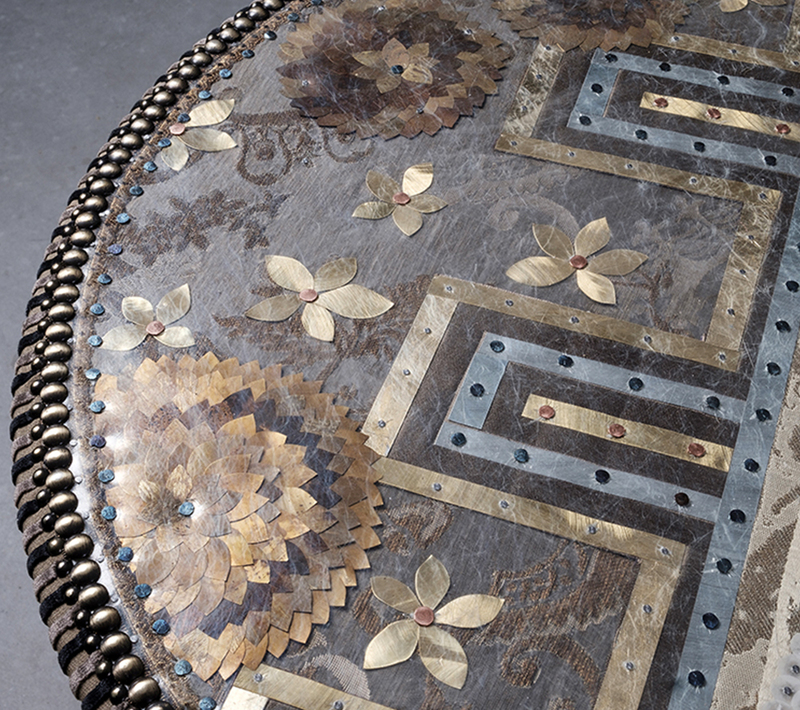 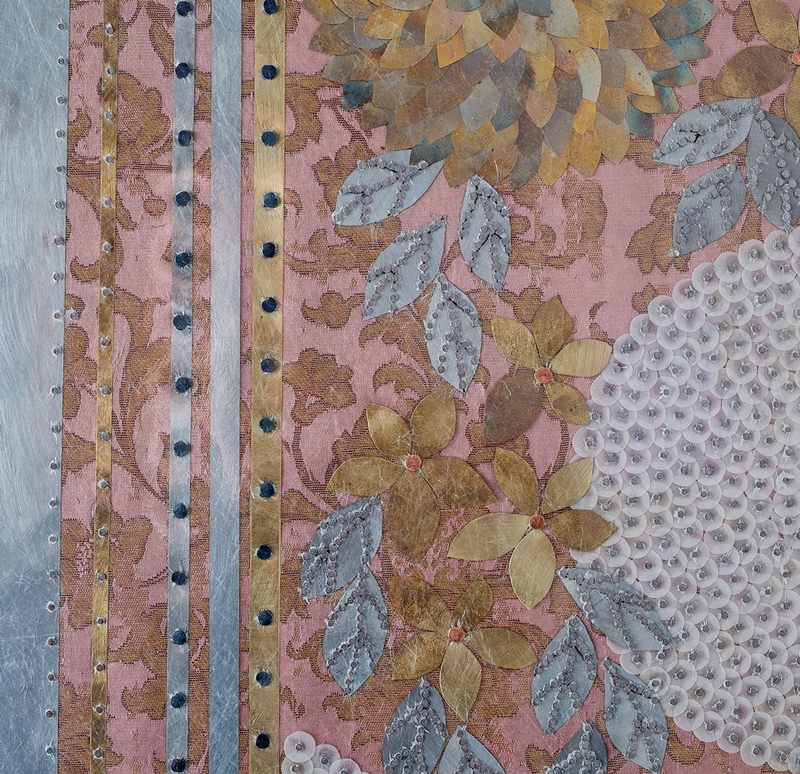 Big rectangular table covered with brass, fabric and fiberglass, decorated with metal elements and sequins hand-cut: corollas, blades, buds, leaves and moons in multicolor fields. 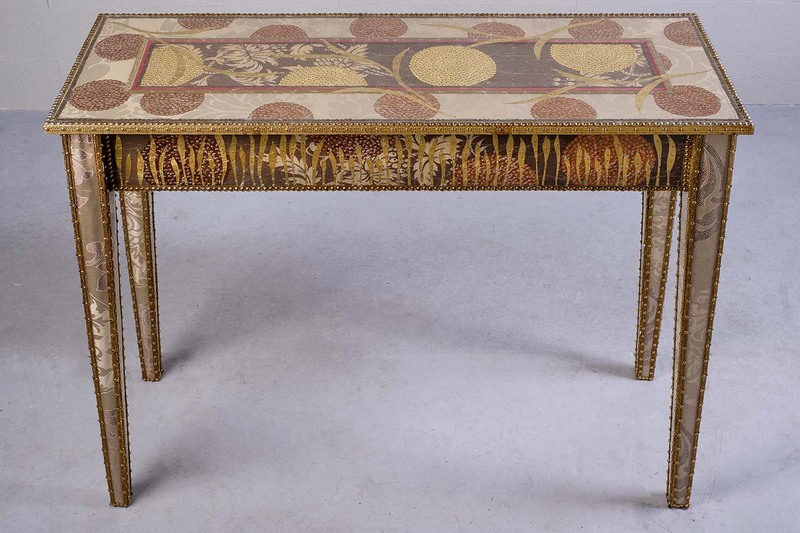 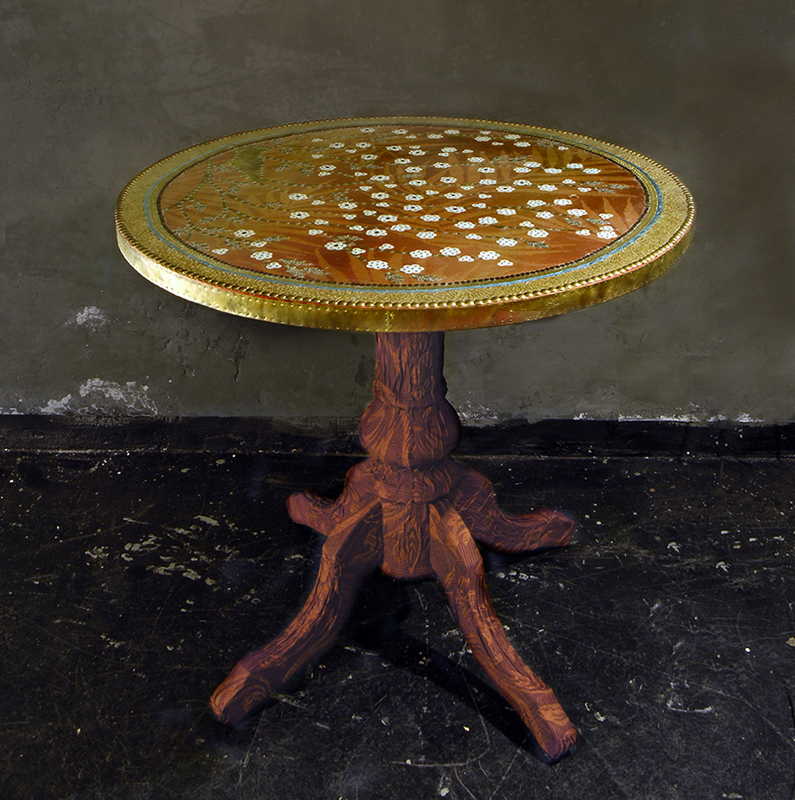 Don Giovanni is ornamental and functional since overlapping the glass surface on the top it can be used as a table. 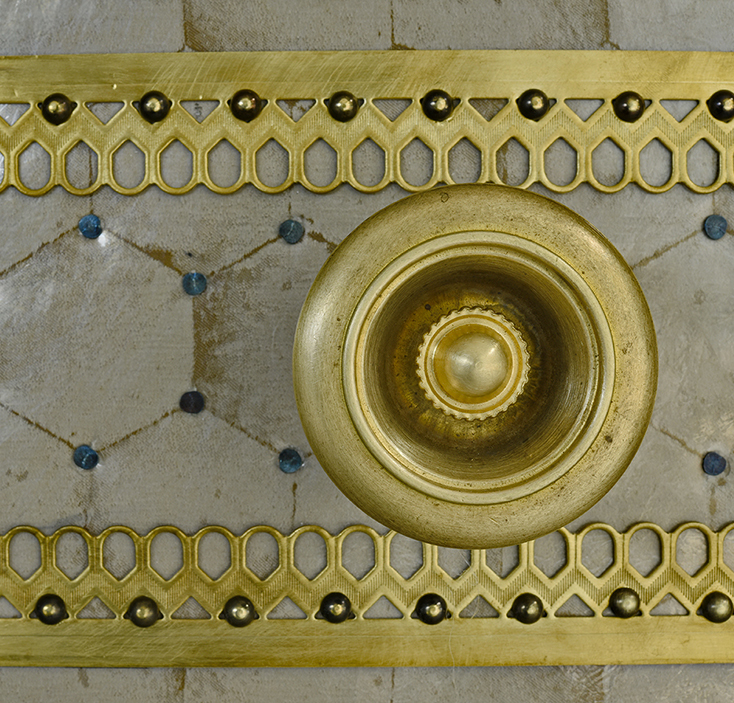 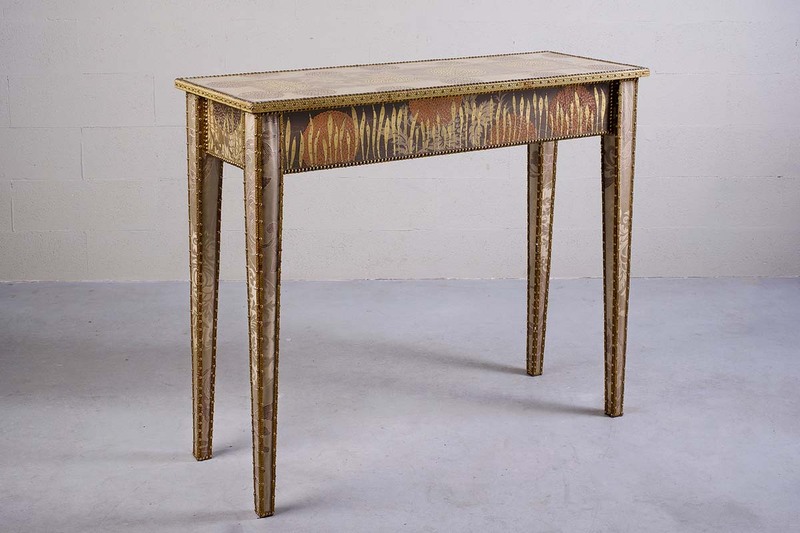 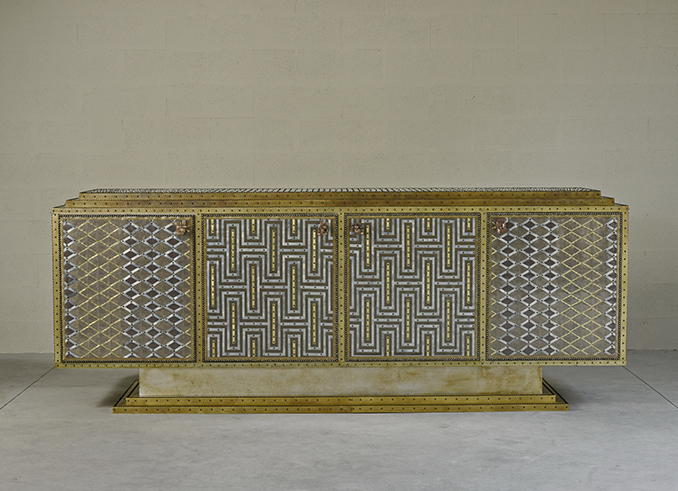 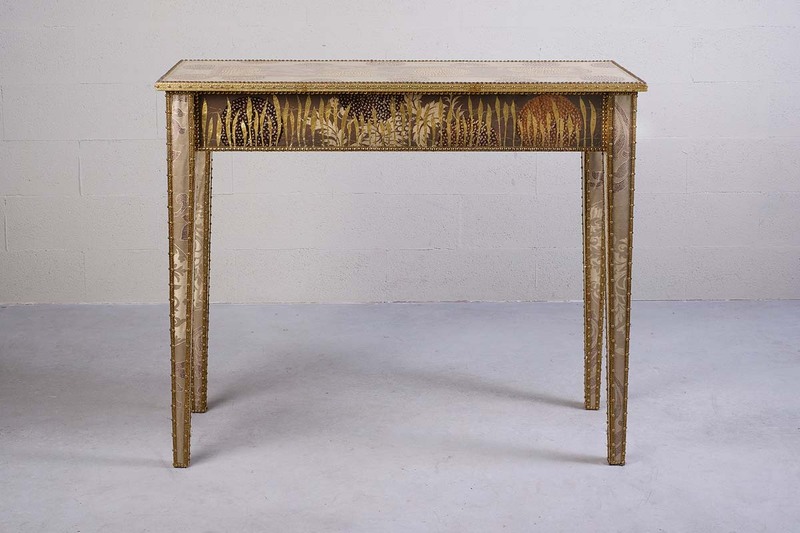 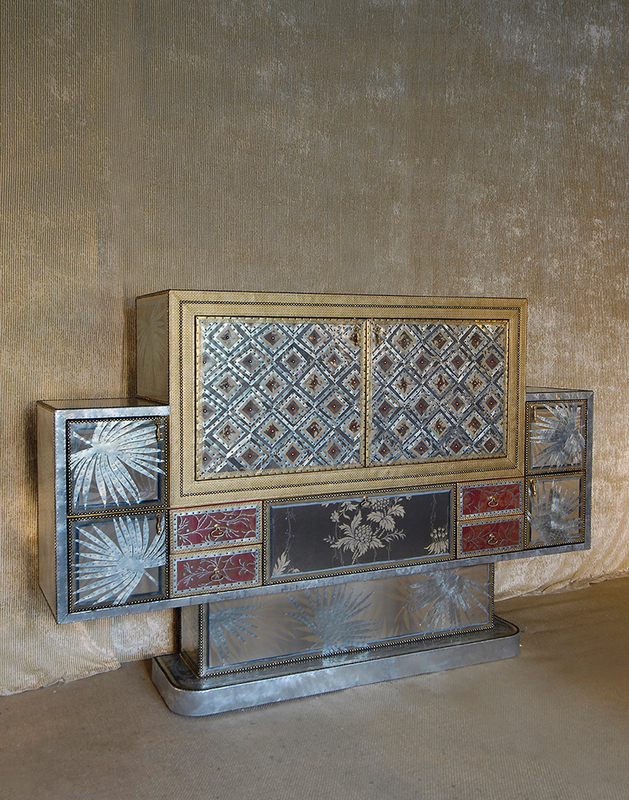 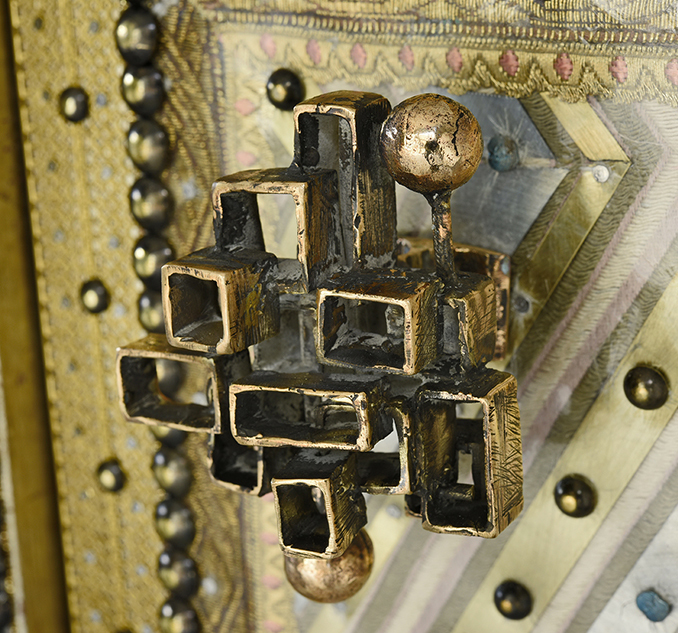 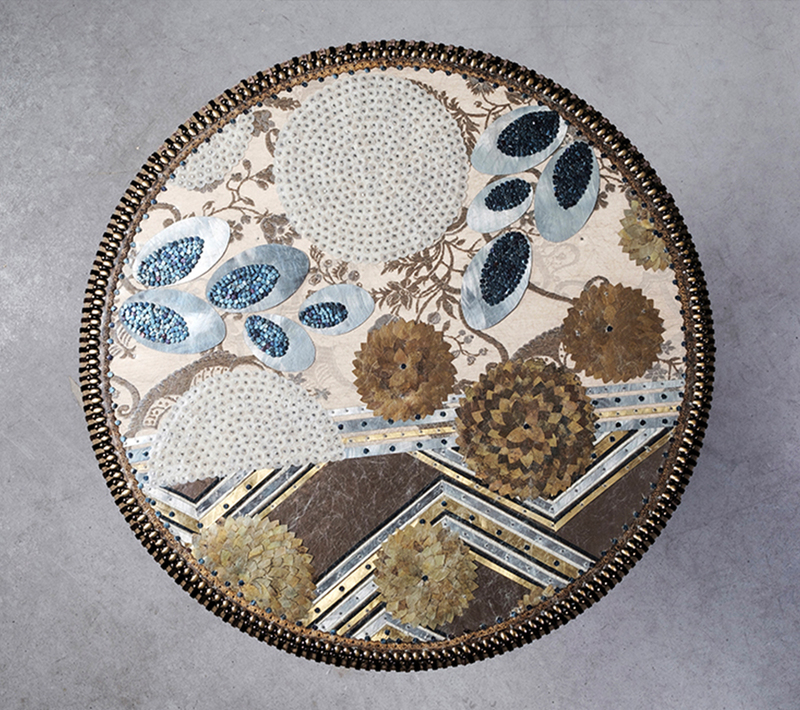 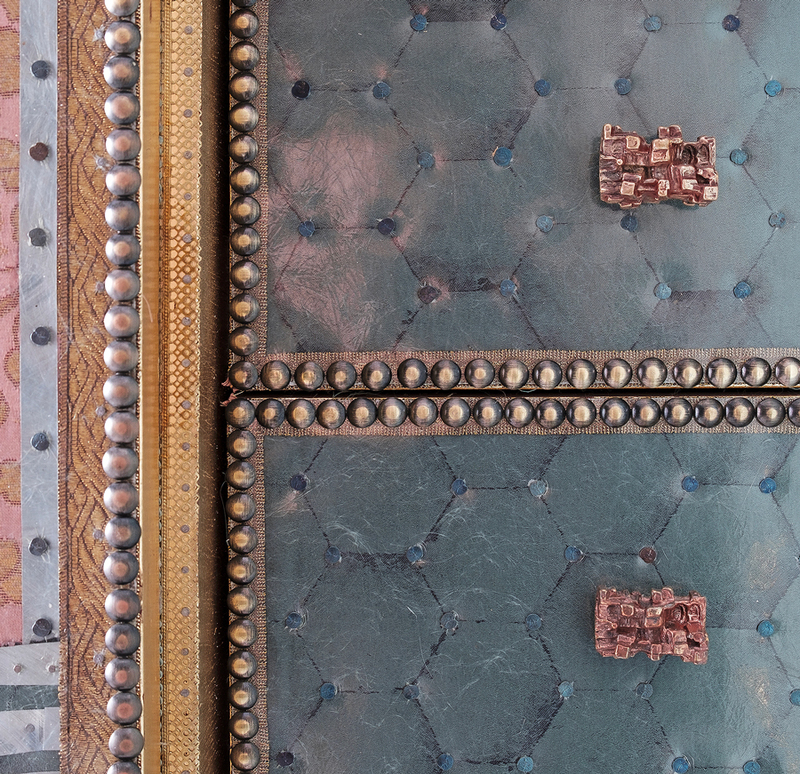 The Sutra console table is covered with brass, fabric and fiberglass, it is decorated by hand with sequins, nails and studs, each metal element is cut by hand to create a whimsical pattern. 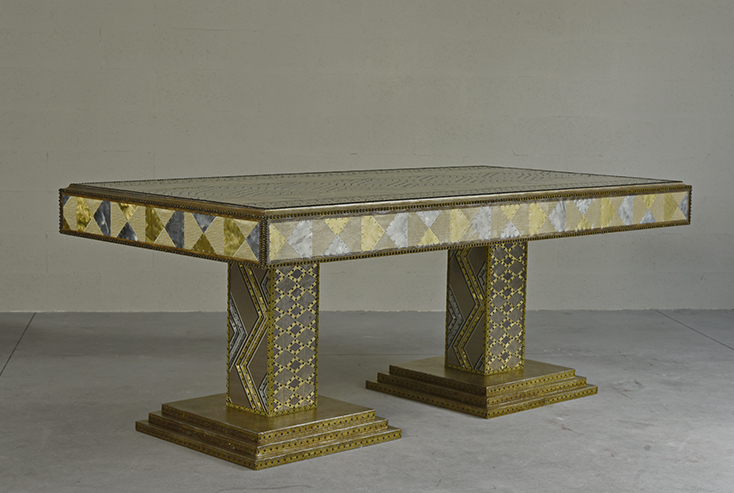 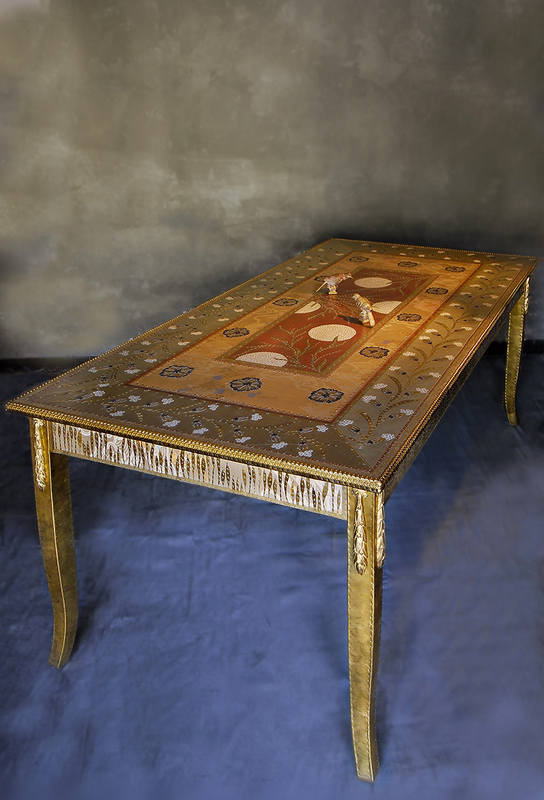 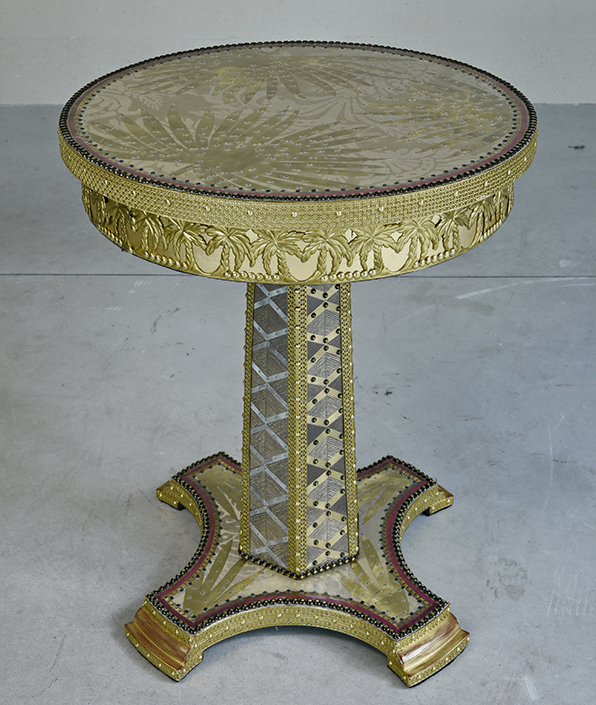 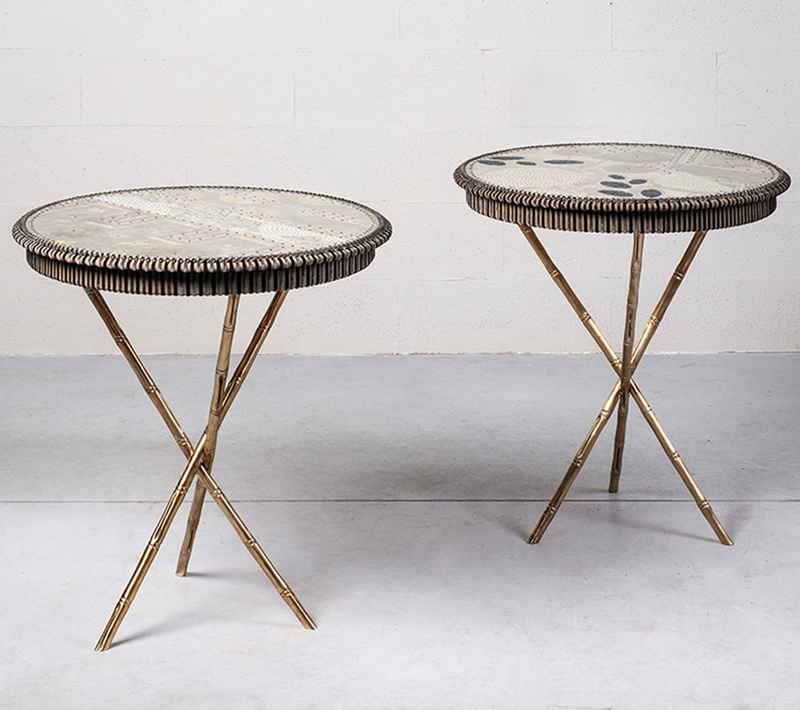 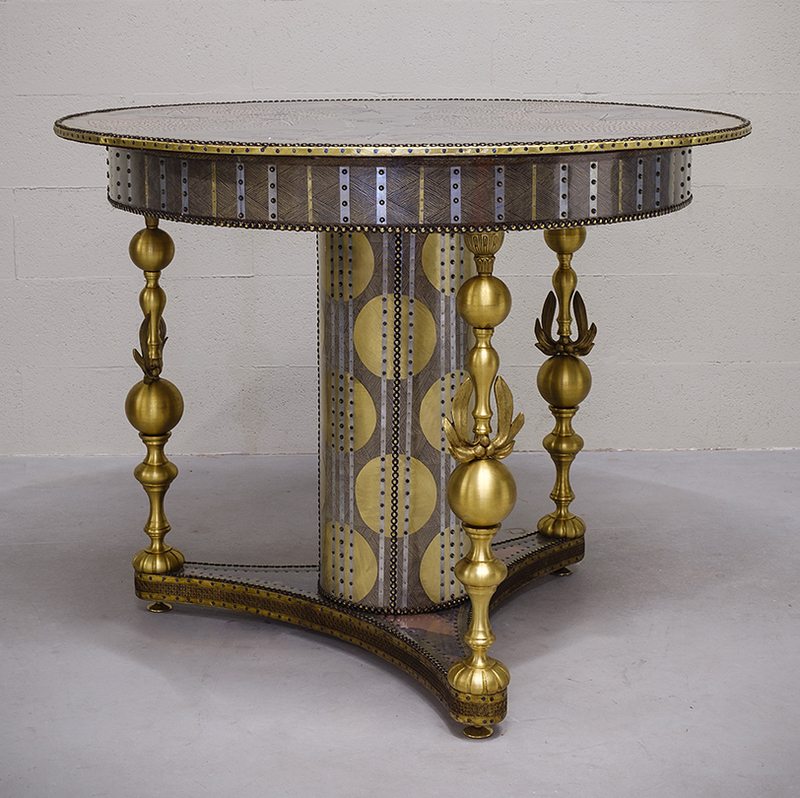 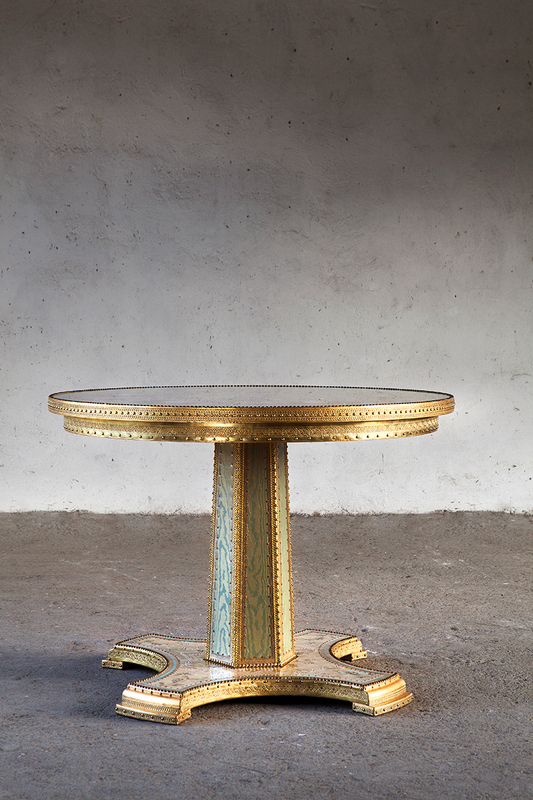 A classic tea table modernized by the addiction of textile, trimming, metal, studs, nails and fiberglass. 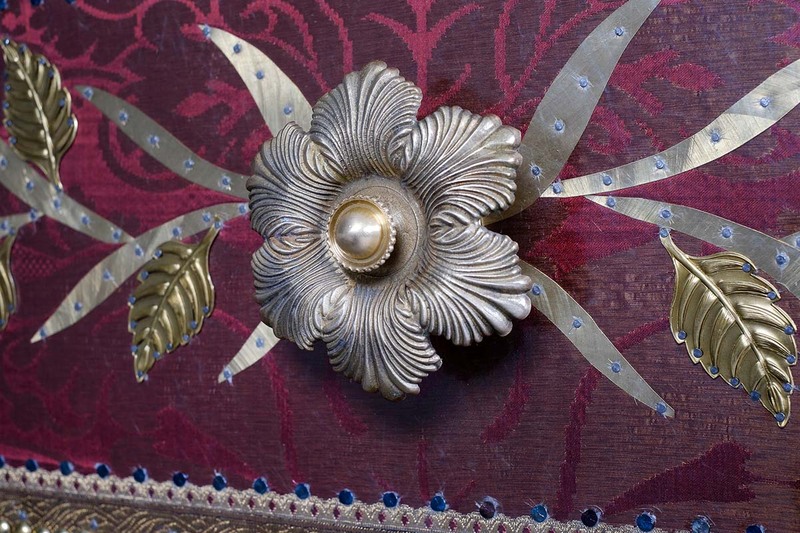 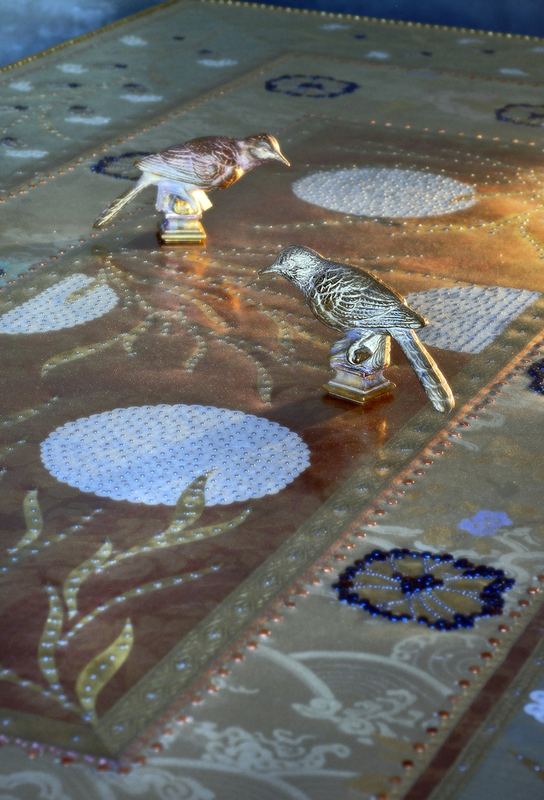 Its innovative and sophisticated technique transform this traditional work into an elegant piece of art thanks to the delicate floral pattern made by hand with sequins and brass or metal shapes. 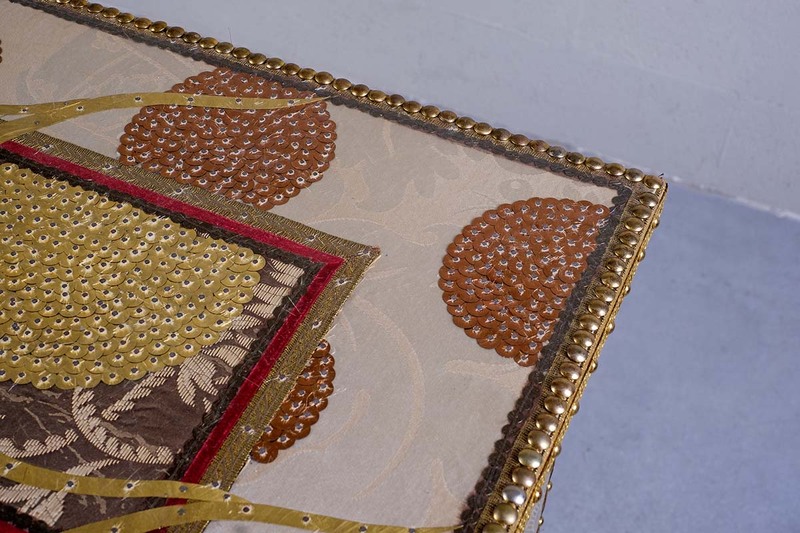 The table legs are covered with valuable textile. 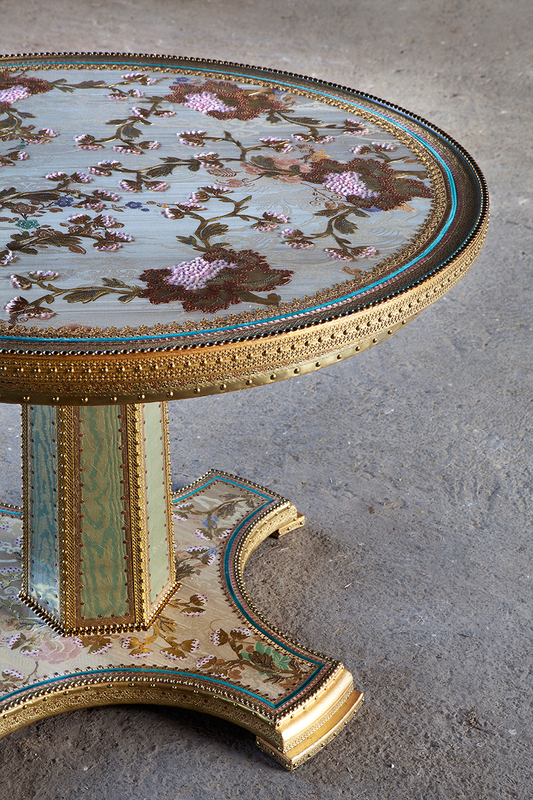 This piece can be customized with different patterns and colours for the top. 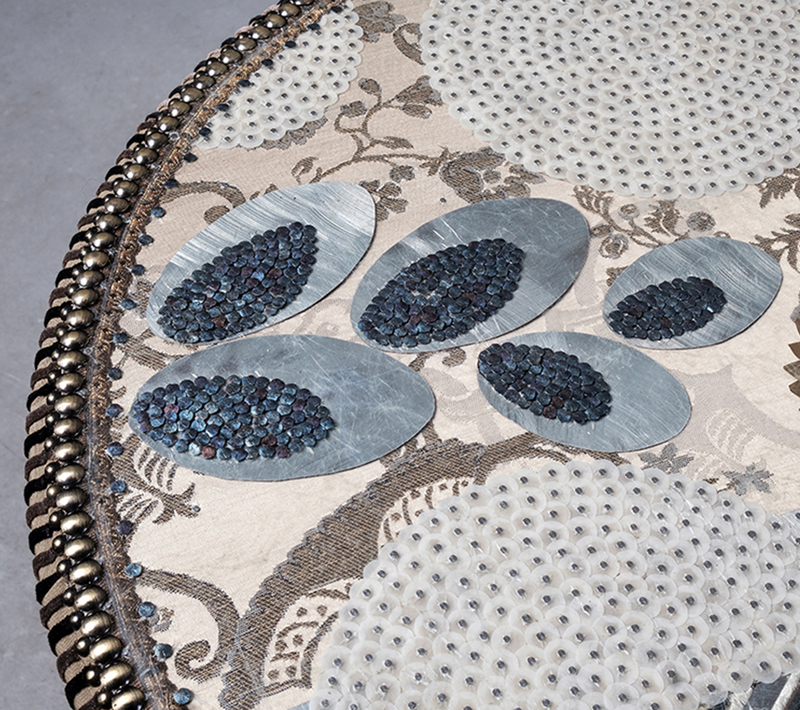 It is perfect in order to create small combinations matching various pieces and choosing different tables’ legs and supports. 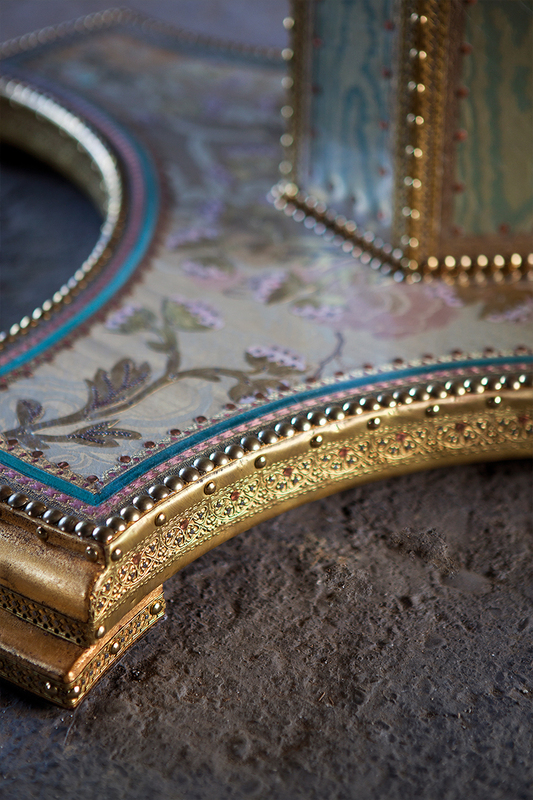 Minor imperfections and variations in the shapes or colours are a typical indication of hand-crafted fabrication. 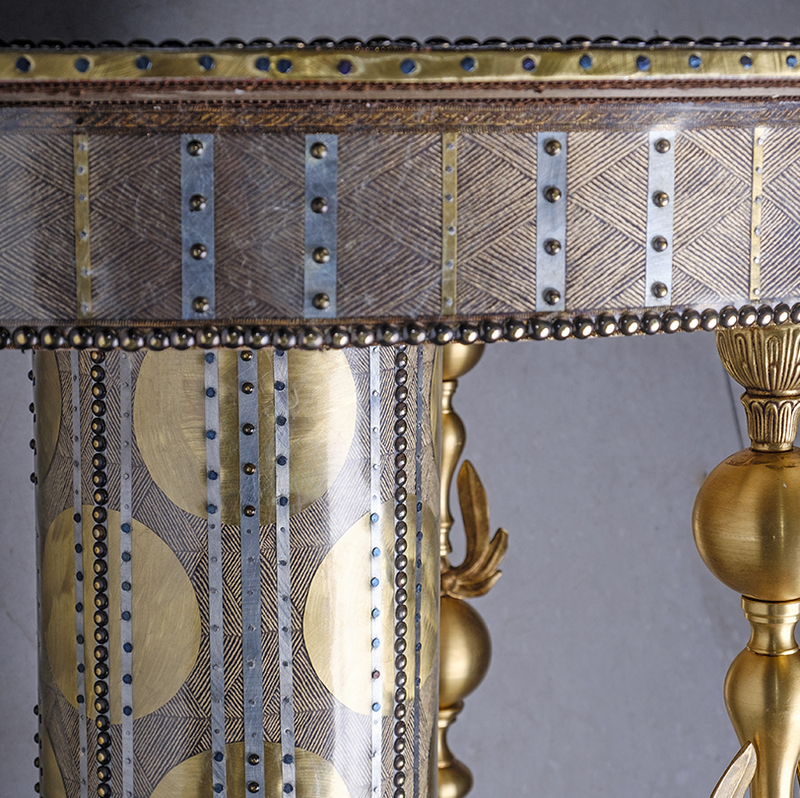 If you notice any small imperfection, you may be assured that this will not diminish its value in any way. 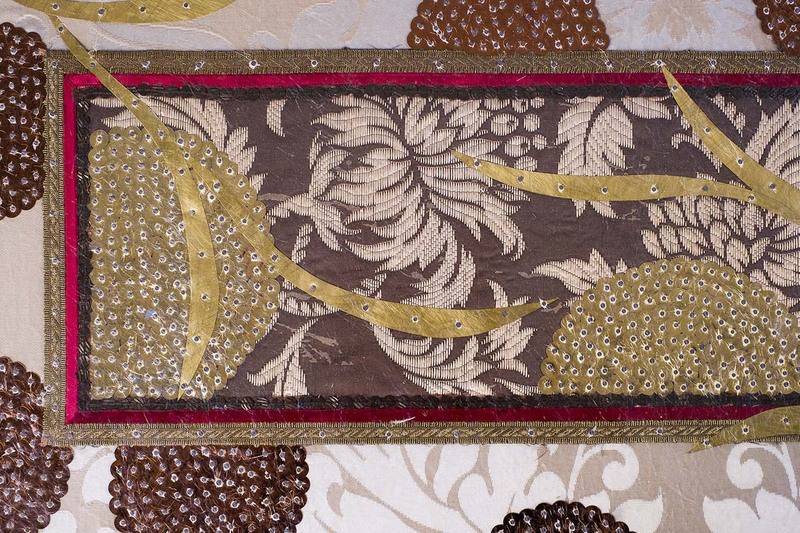 Individual features such as fabrics and other materials’ colours may vary. 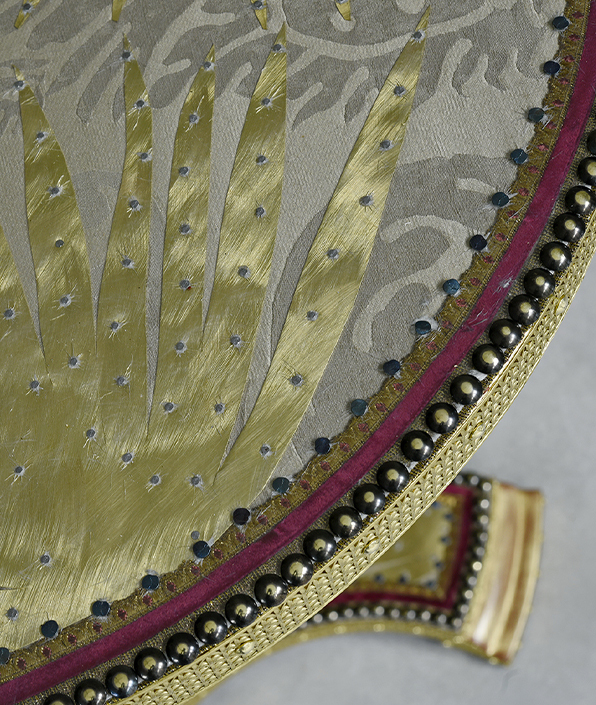 ​The product images shown are for illustration purposes only and may not be an exact representation of the products.